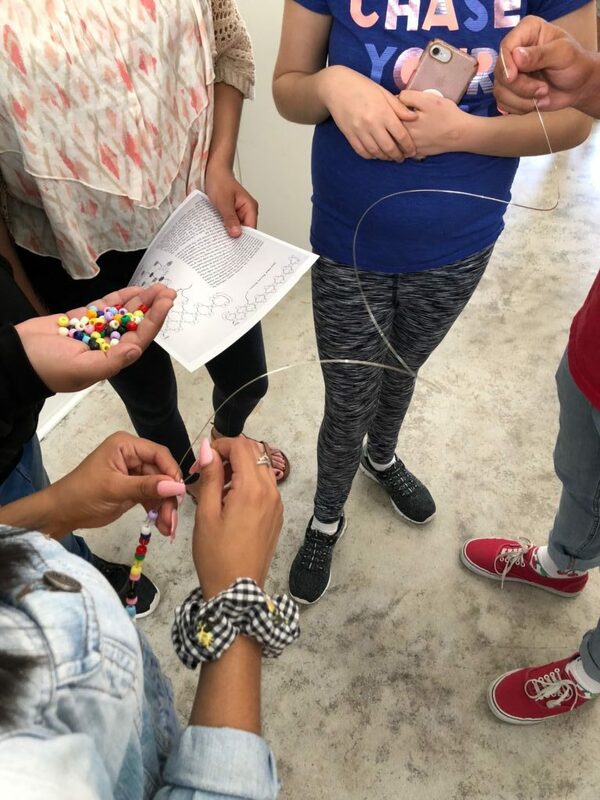 Van Nuys High School visited the Craft in America Center today for their Spring field trip and saw the work of Joyce J. Scott and learned about her work. 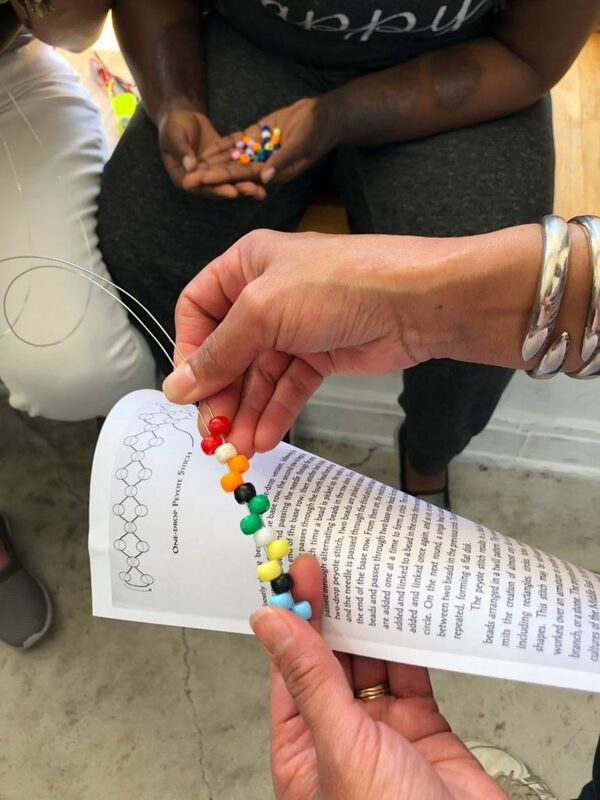 We had 39 High School students, most of which were Special Education students, and 11 classroom assistants come into our space for a special viewing of “The Circuitry of Joyce J. Scott” exhibition. 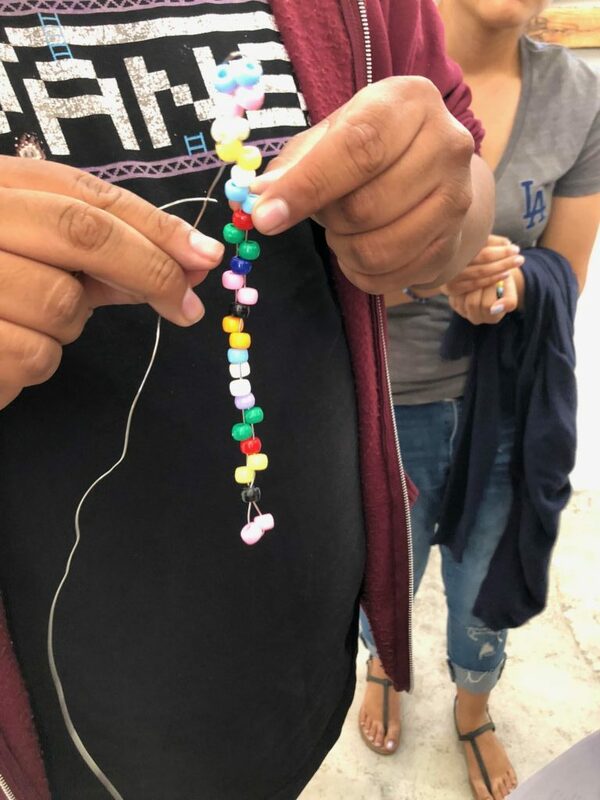 About 20 students, who ranged from mildly to severely emotionally distressed individuals, participated in today’s lesson plan and activities. 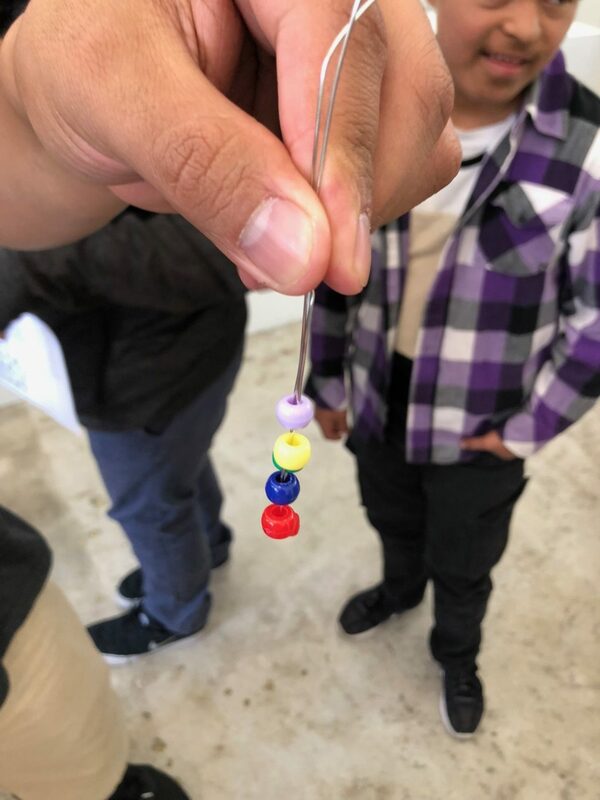 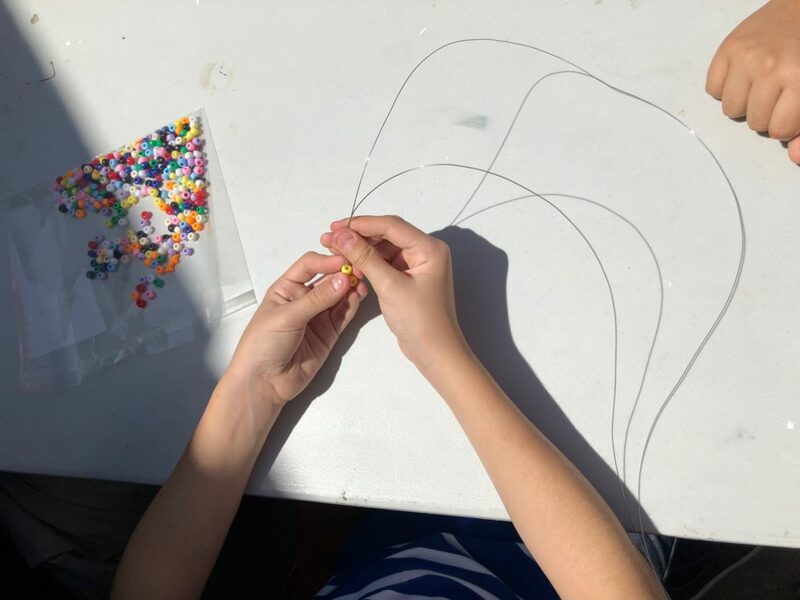 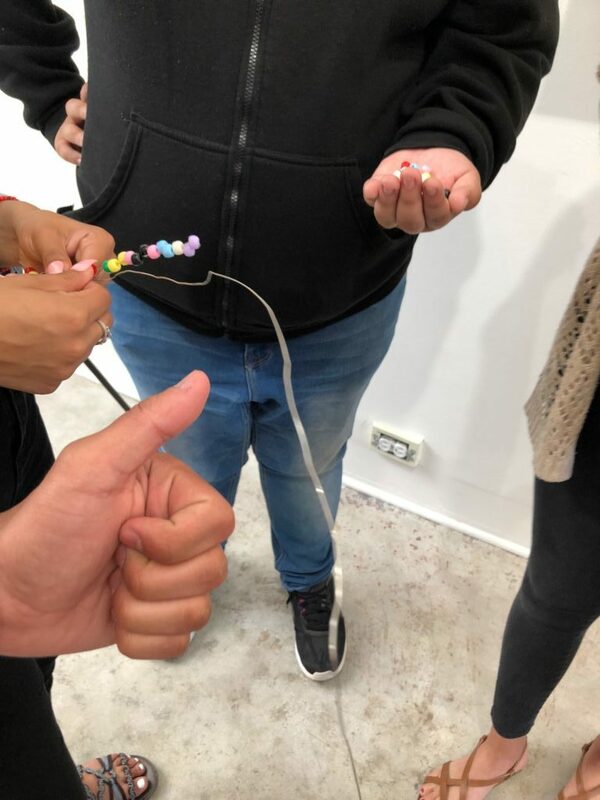 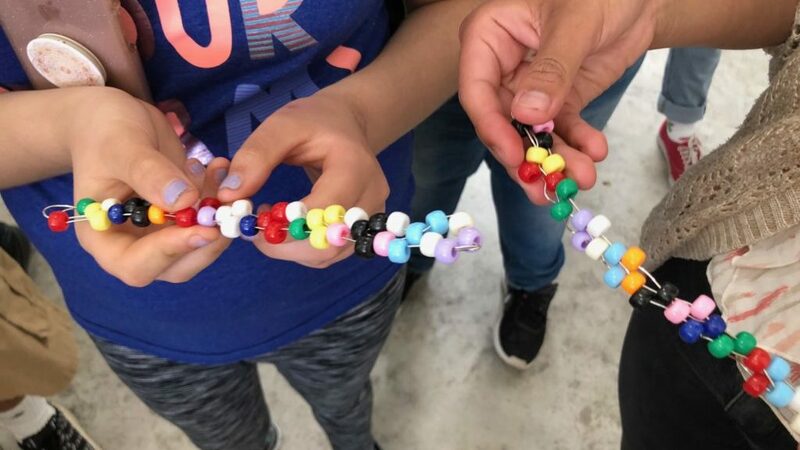 Although there were over 40 bodies in our modest space and everyone was so enthralled with the exhibition that it became difficult to grab their attention at times, the students, in groups of 5, dedicated 40 minutes to learning and creating a Peyote Stitch. 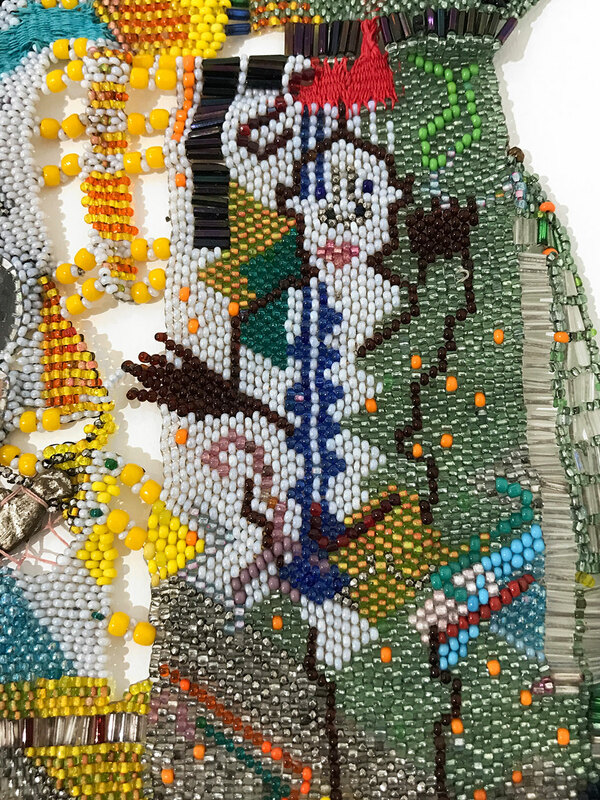 The Peyote Stitch is employed in all the beaded pieces displayed in this exhibition so it was an exciting and rewarding way to partake in beading like a professional artist does. 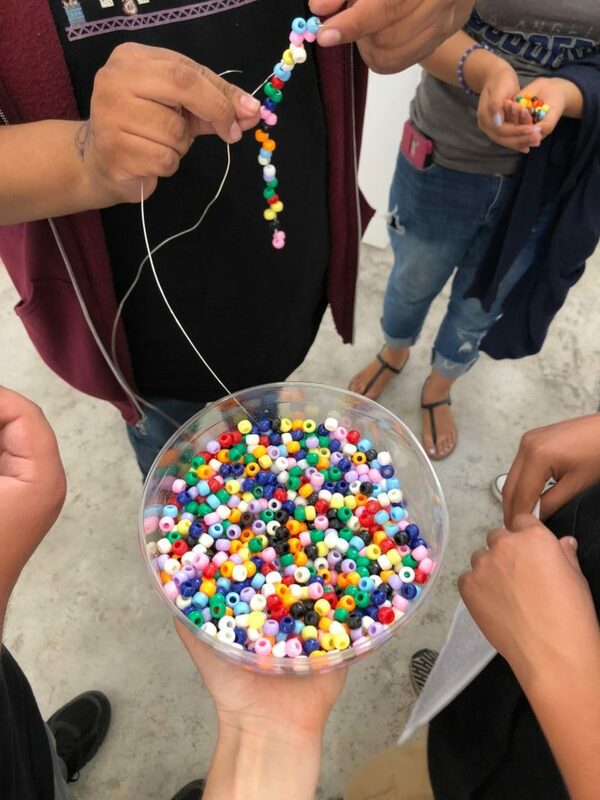 Every group finished a one-drop peyote stitch and took them back to school to share with their other classmates, friends and families. 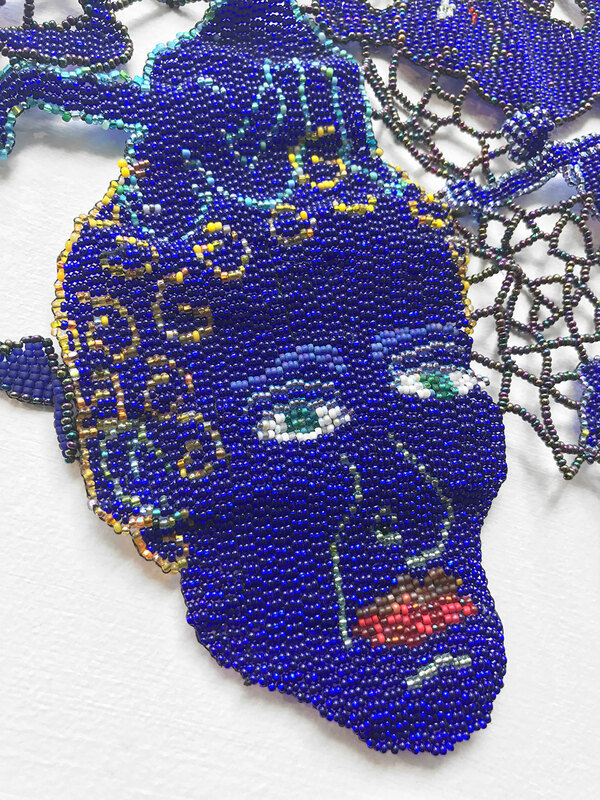 This talk will discuss the ways in which Joyce J. Scott has consistently broken the rules and made her own way as an artist of color in America. 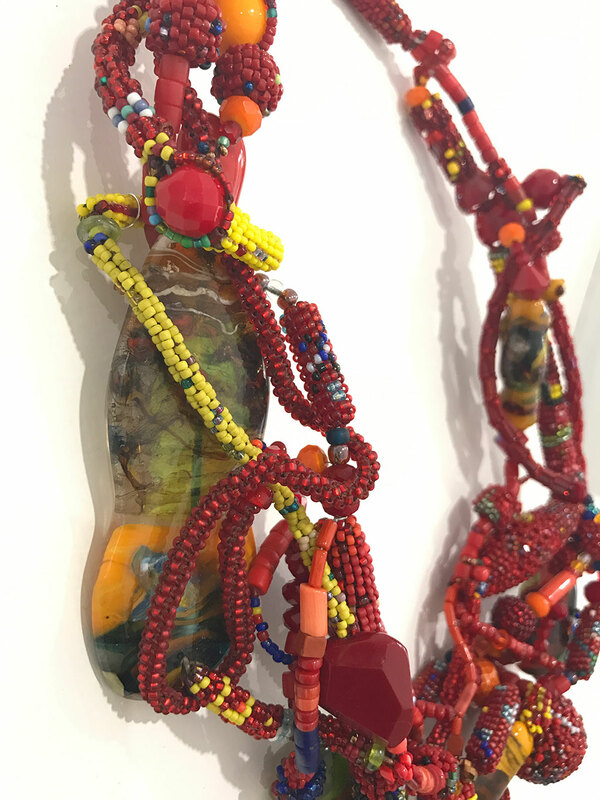 At the same time, she managed to propel forward the whole concept of craft and jewelry in particular as a medium that can carry content. 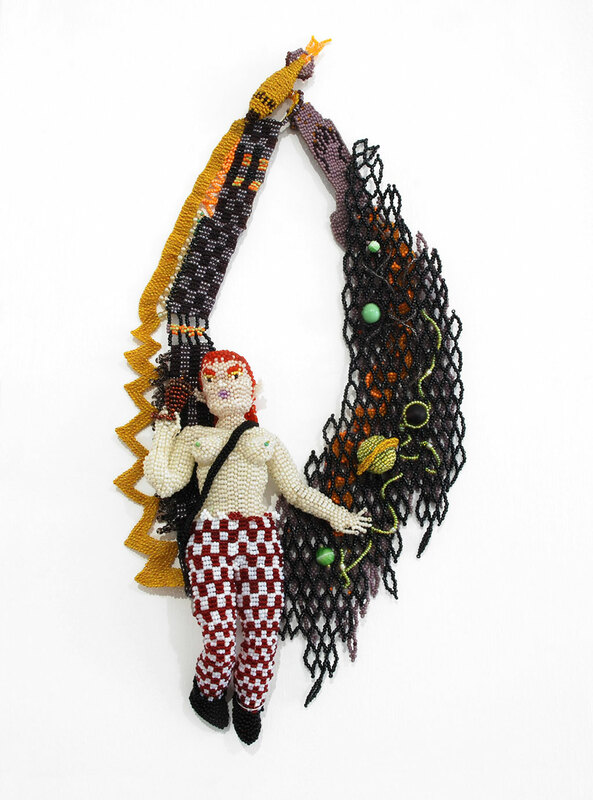 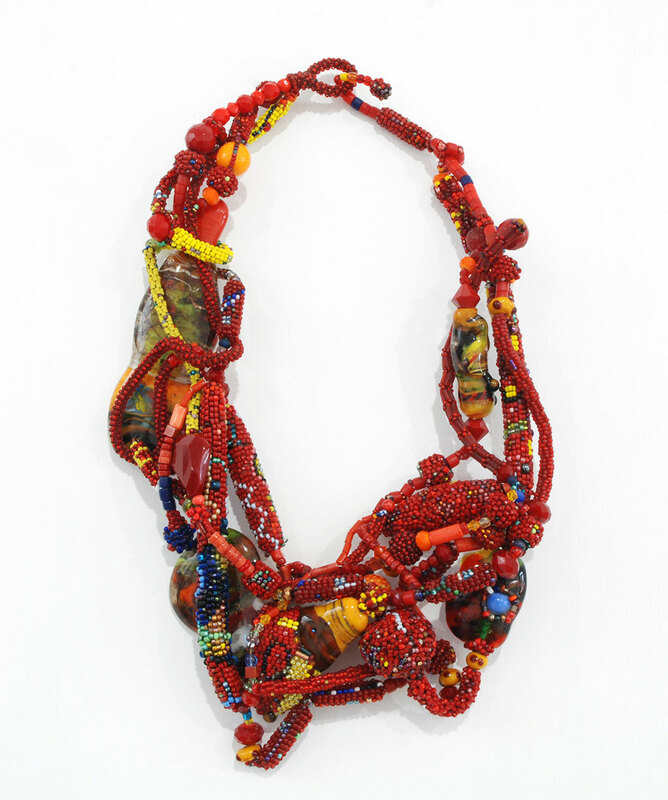 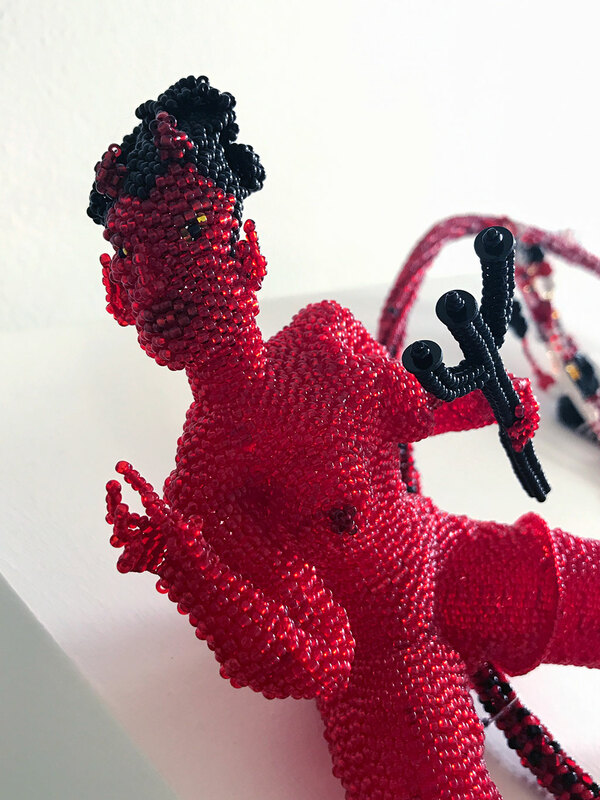 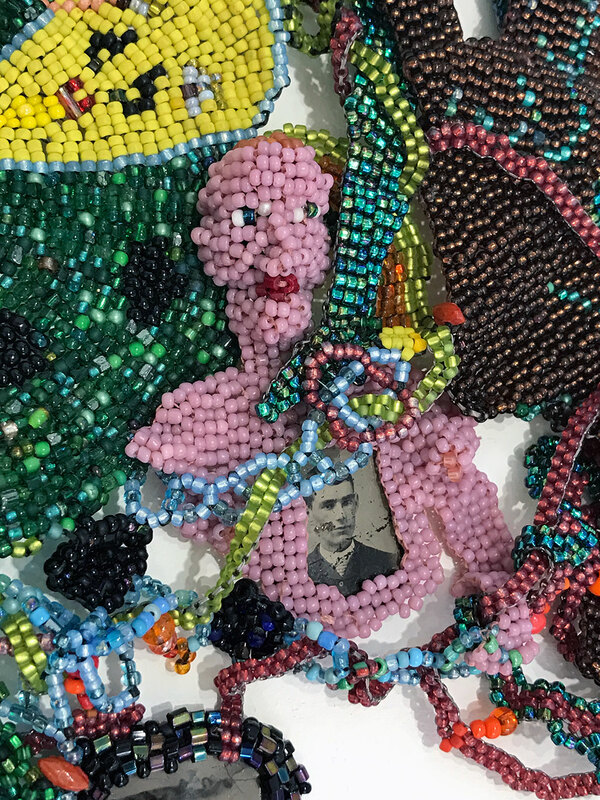 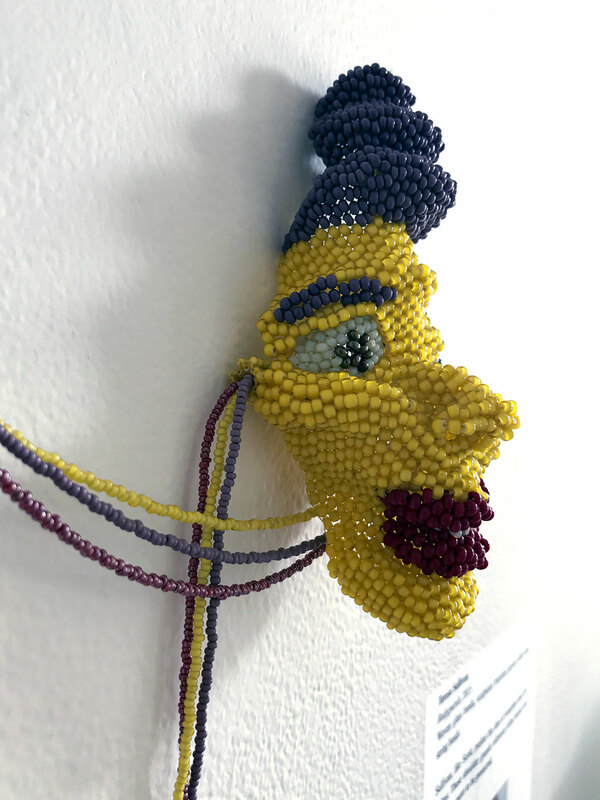 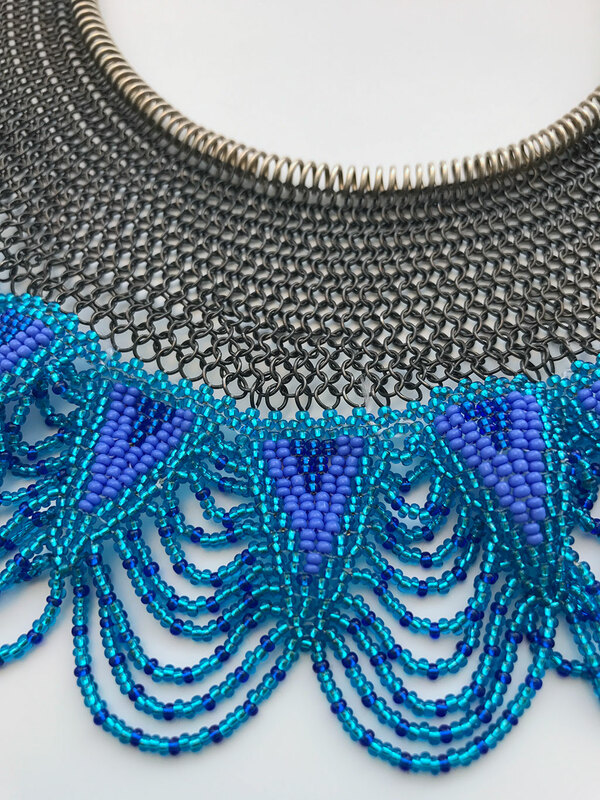 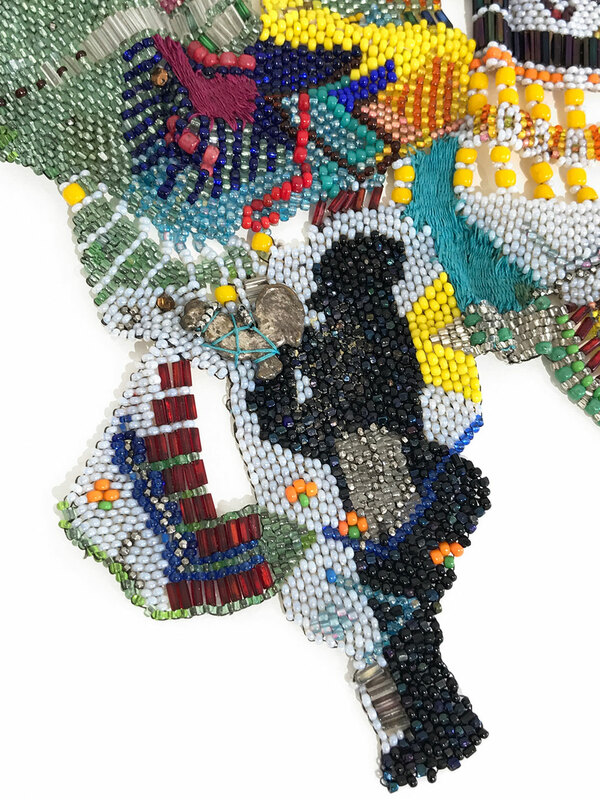 Cummins will show a series of Scott’s more political and very powerful beaded necklaces and point out the ways in which she uses the language of beads for pieces packed with layers of meaning. 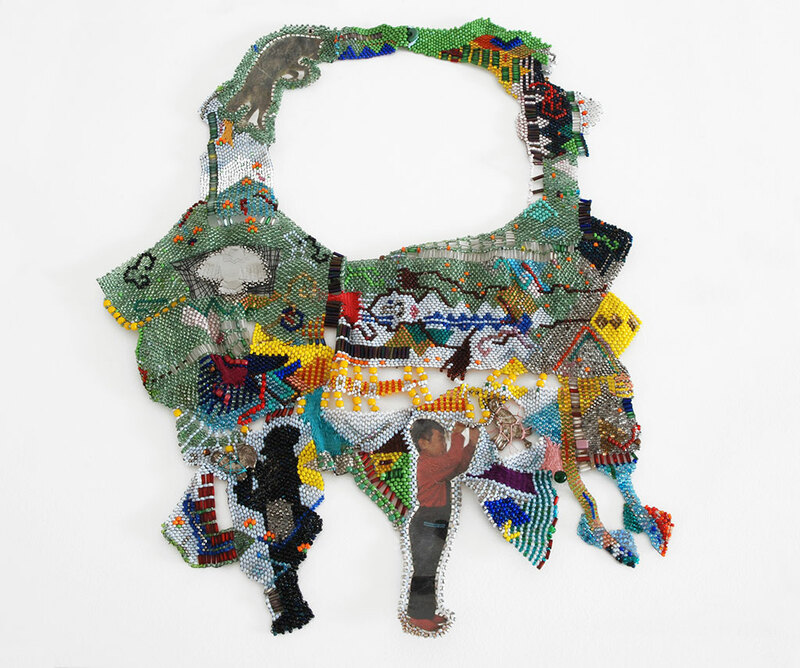 Scott’s background as a daughter of an artist who quilted and her accomplishments in the visual world will be touched on to further give evidence of her boundary-busting ways. 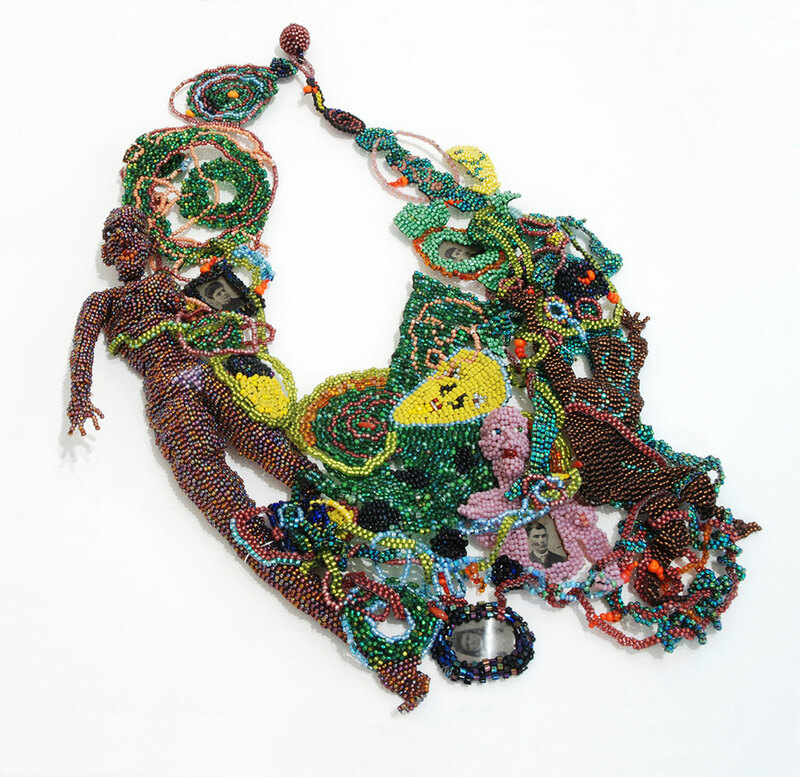 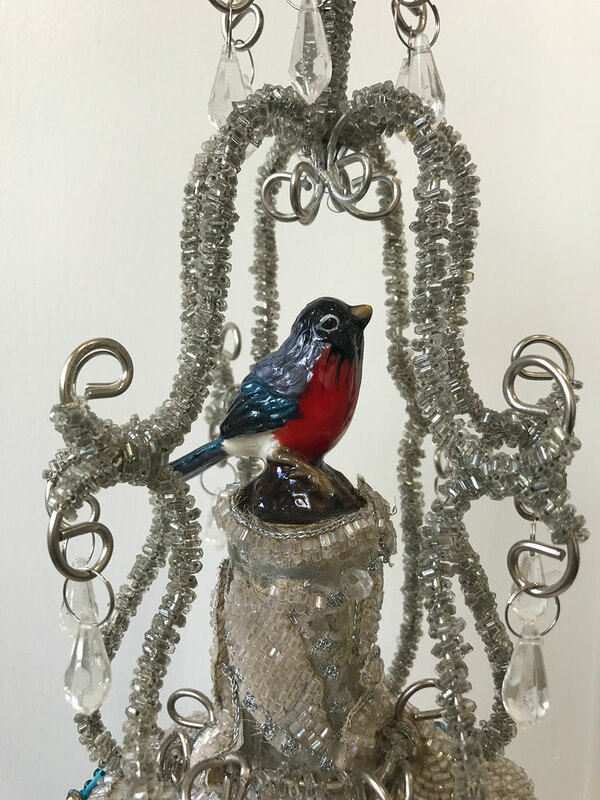 Visionary artist Joyce J. Scott works in a multitude of media and has had a profound influence on various communities of artists through her beaded sculpture, art jewelry, and more. 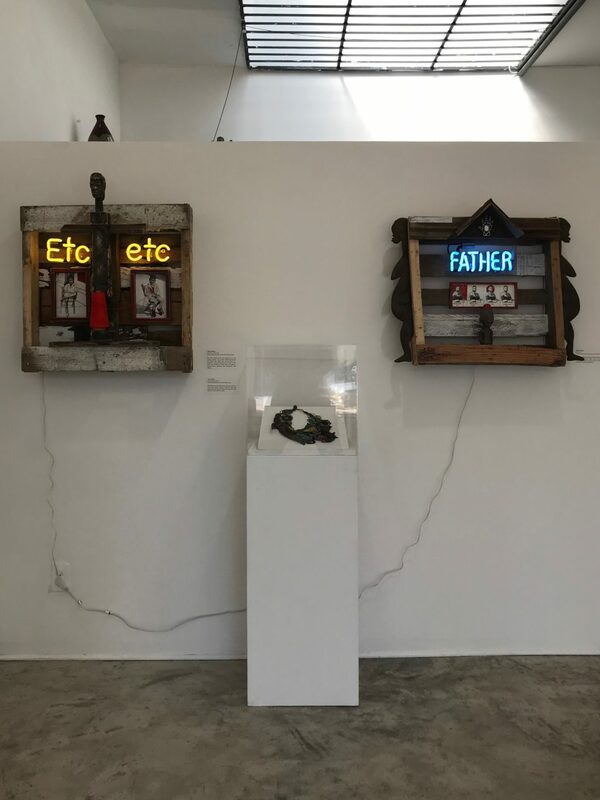 Circuitry, for Scott and this exhibition, is approached in four ways: through the construction of her pieces; as connection to the past; as hard-wiring to the national and global present; and finally, via Scott’s network of artists and friends. 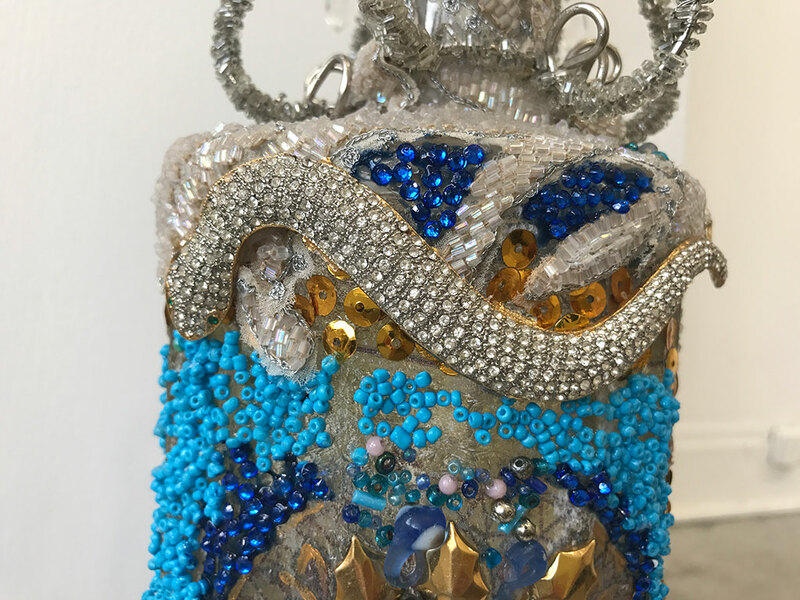 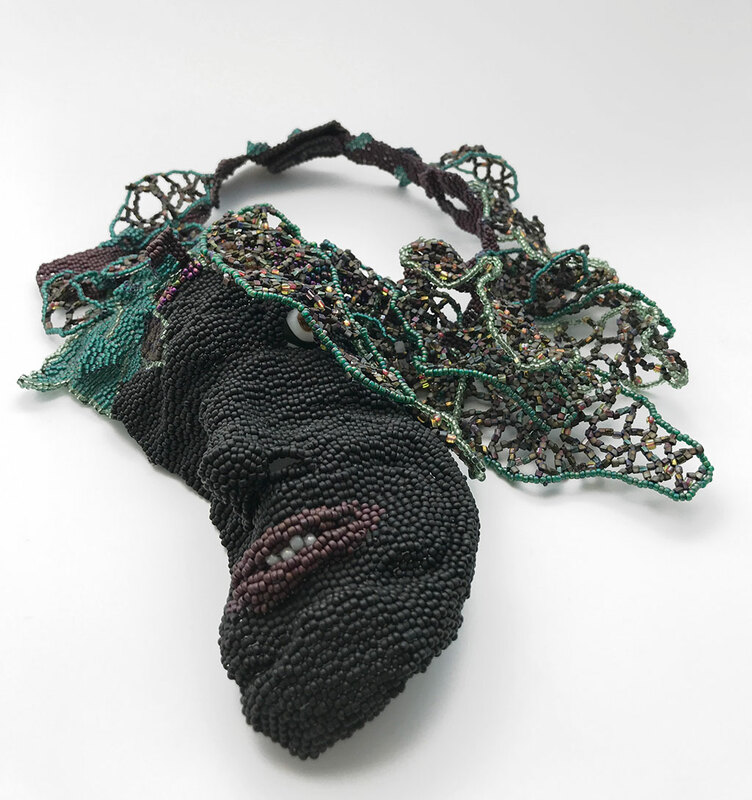 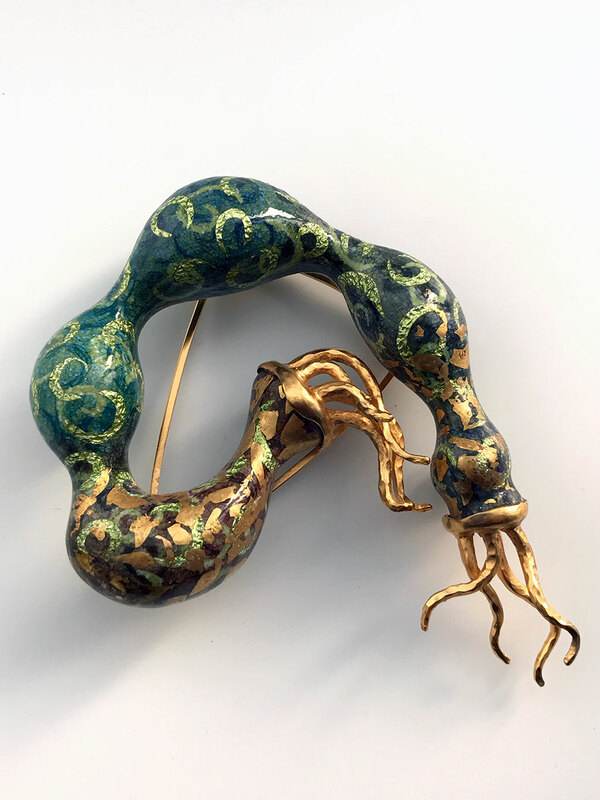 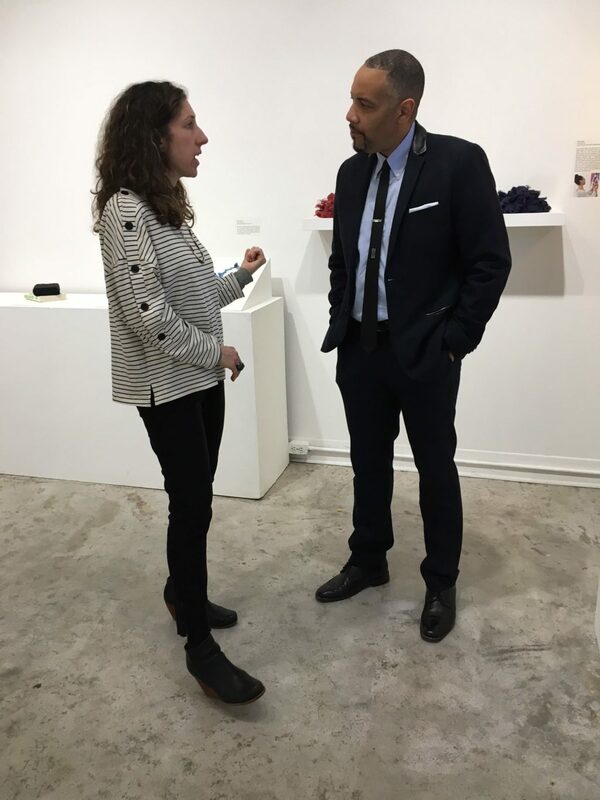 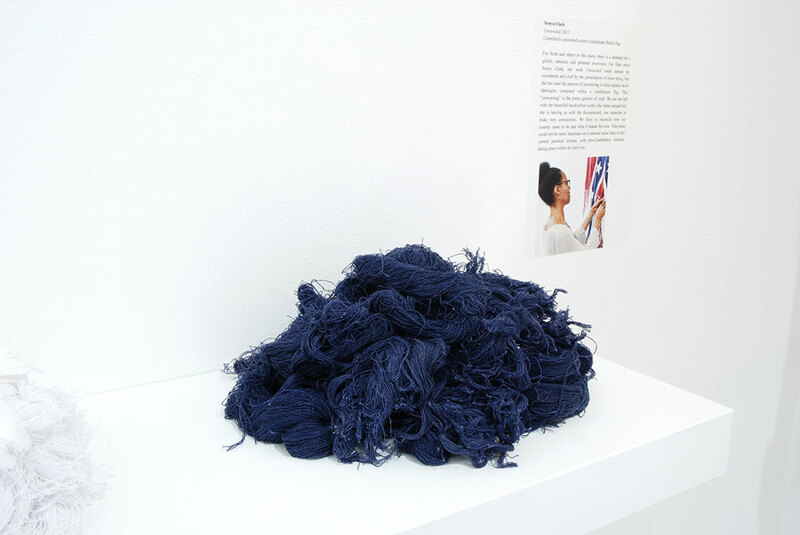 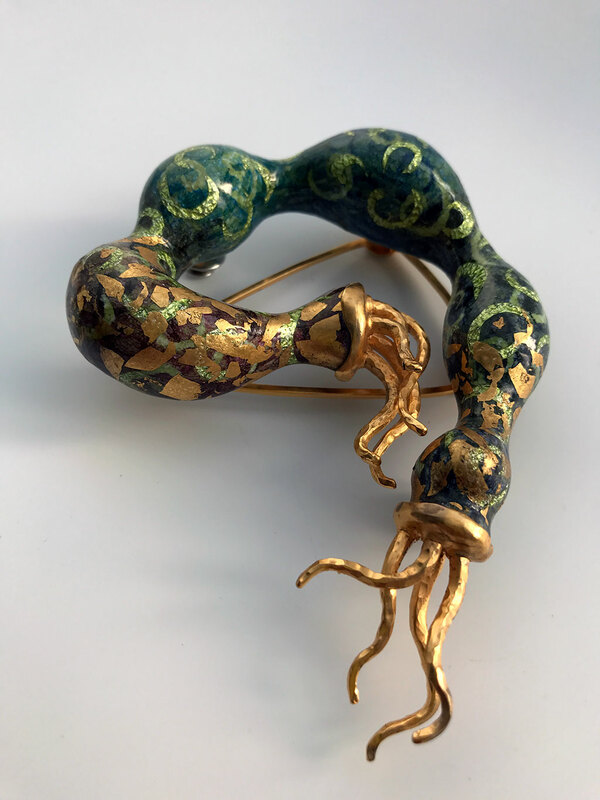 Scott and the other artists included in this exhibition push and expand the potentiality of what sculpture and wearable art can be, where they intersect, and how they affect each other. 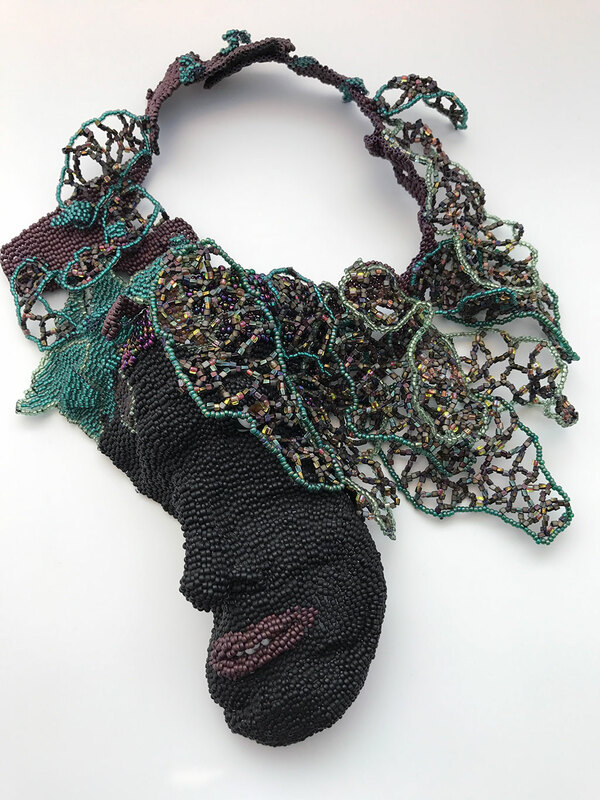 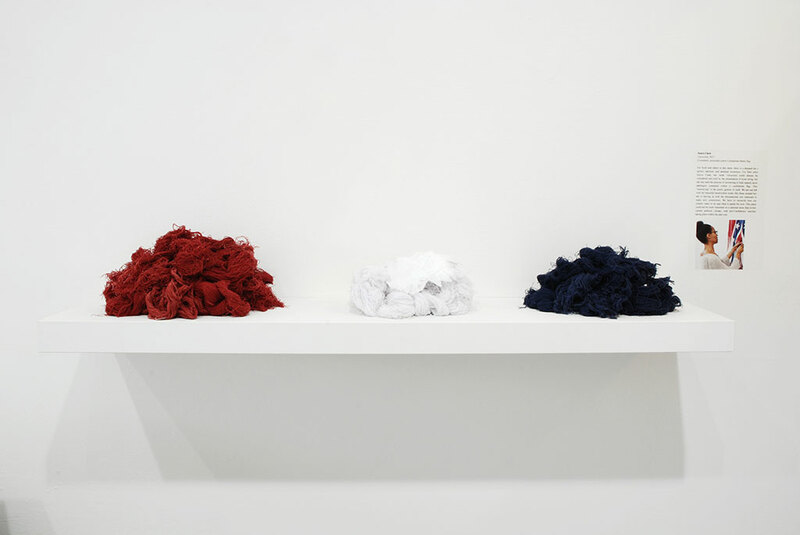 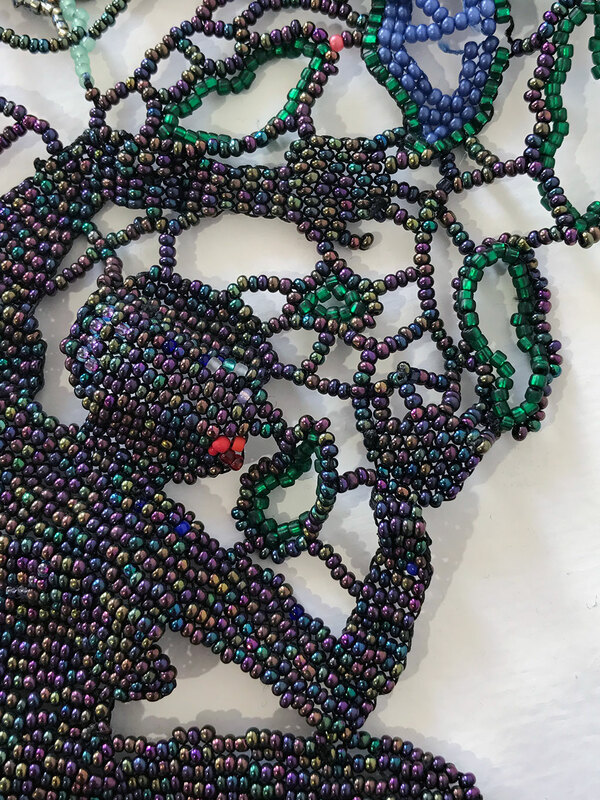 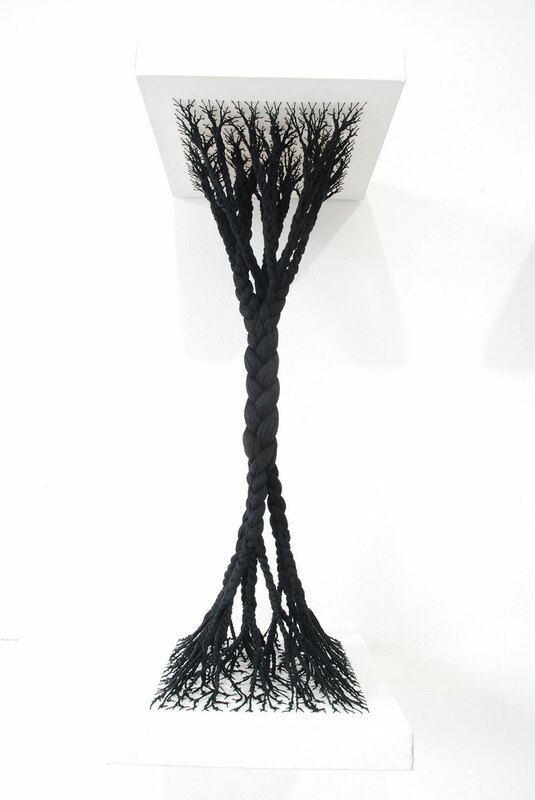 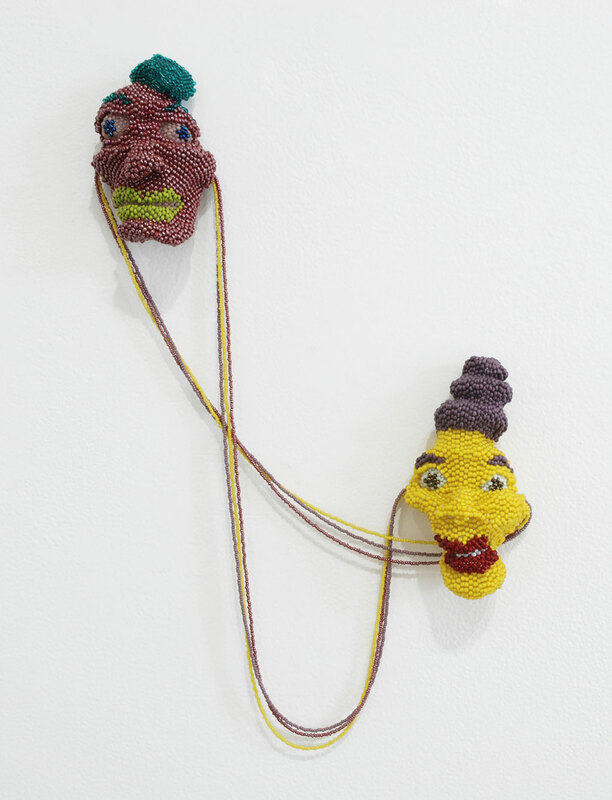 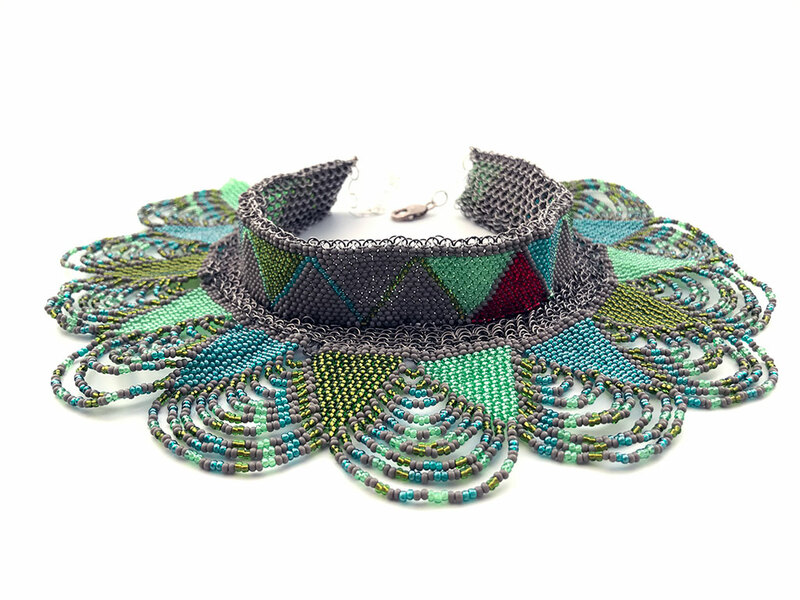 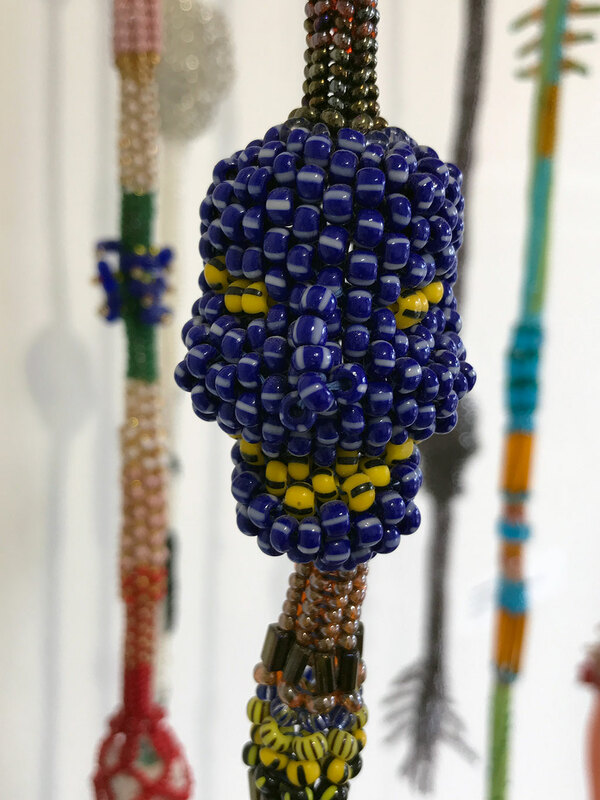 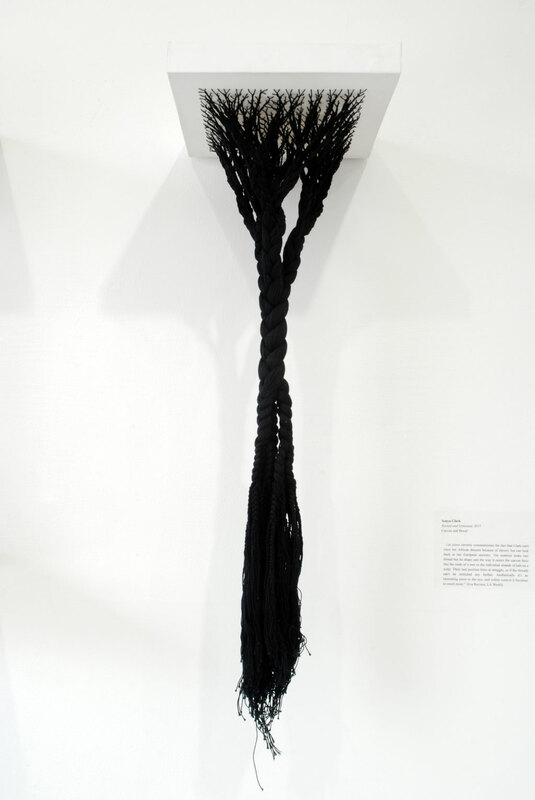 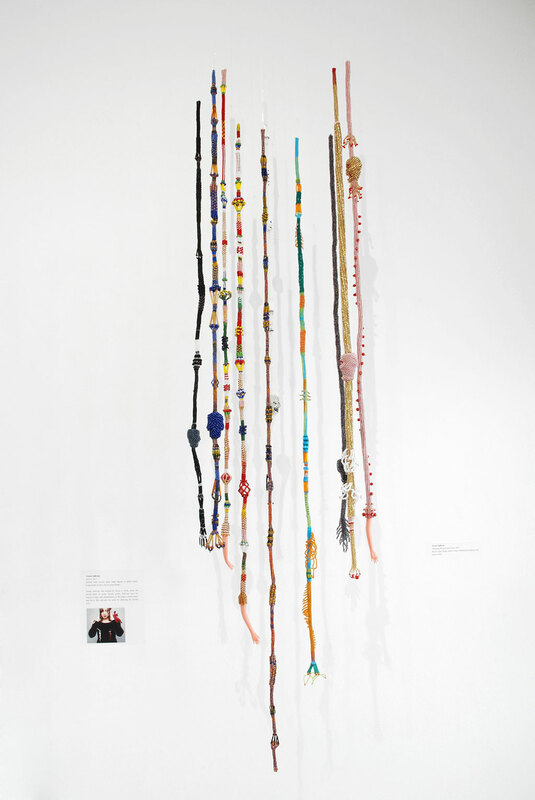 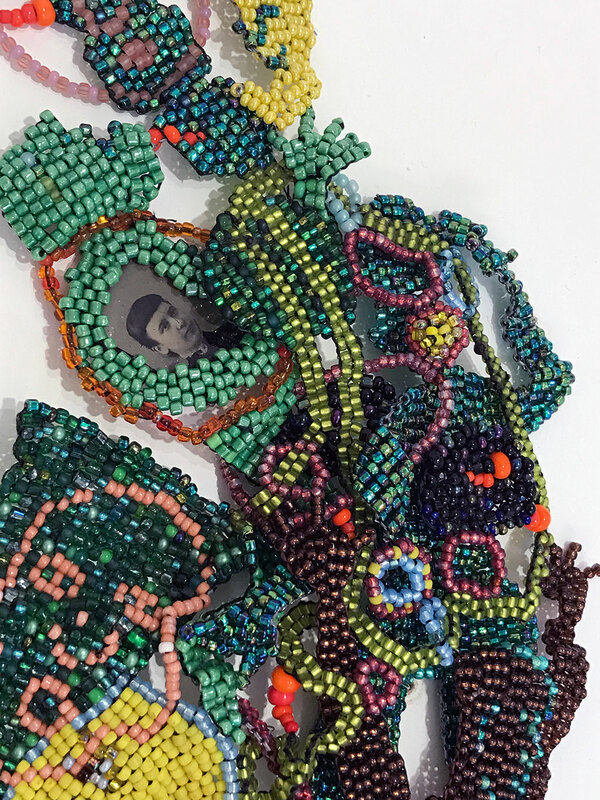 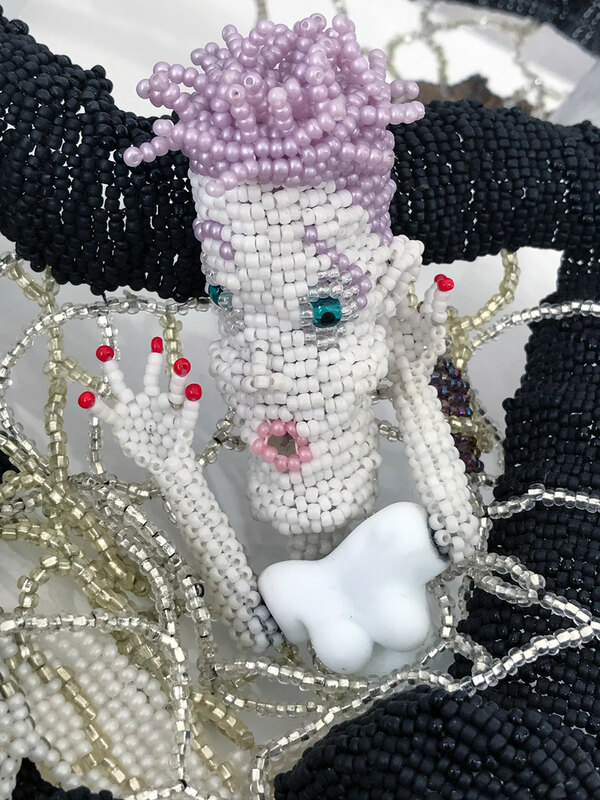 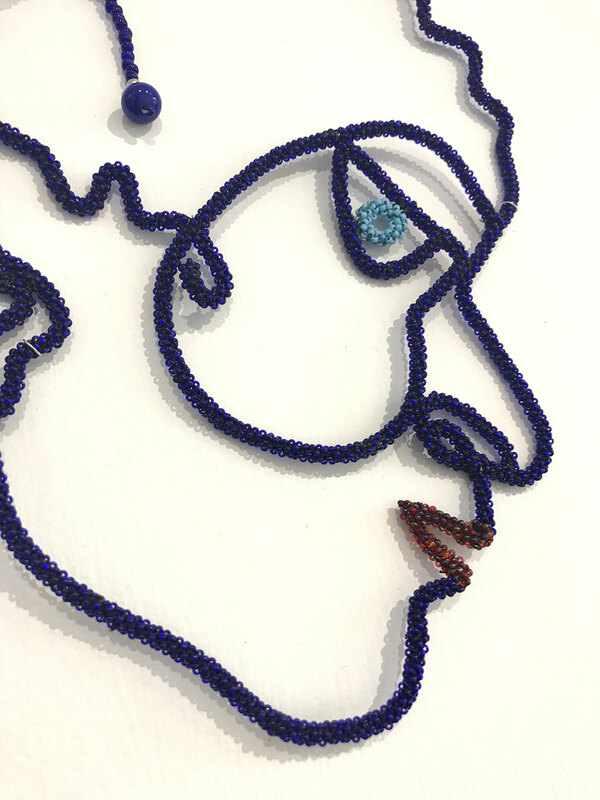 This exhibition forms a dialogue between ten of Scott’s exemplary beaded neck pieces placed in conversation with beaded, fiber and mixed media works by Sonya Clark, Oletha DeVane, Eve France, William Rhodes, and Teresa Sullivan. 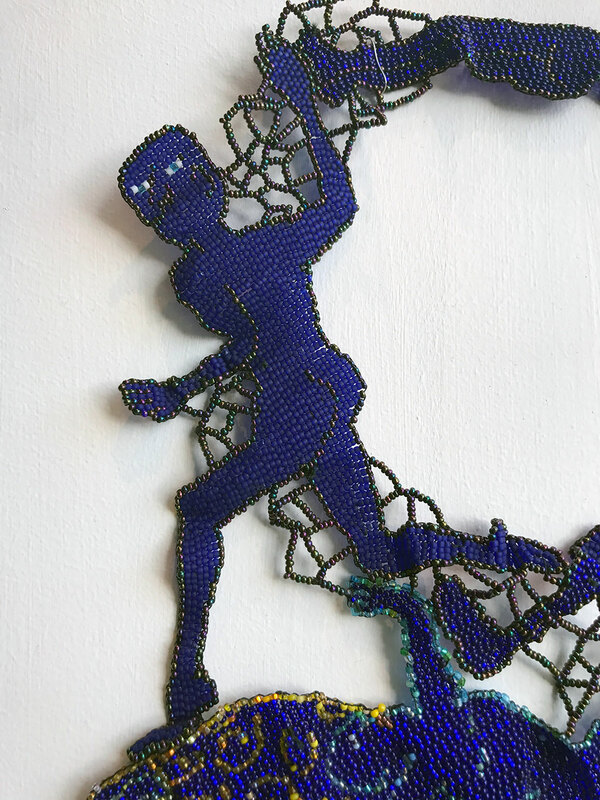 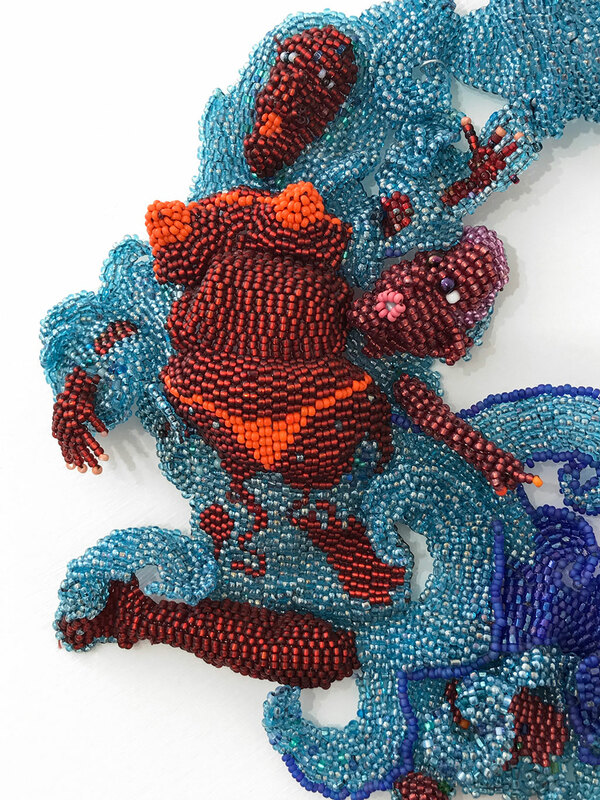 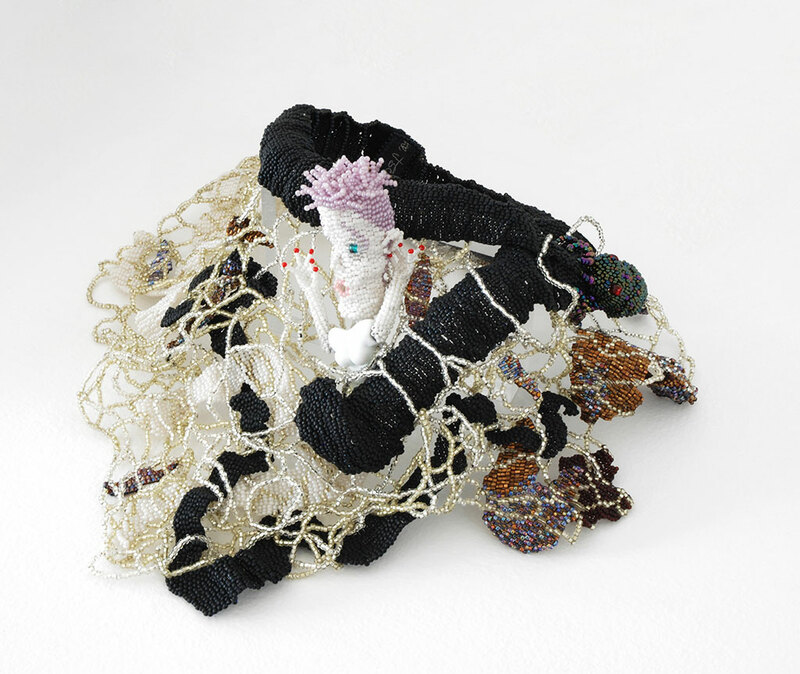 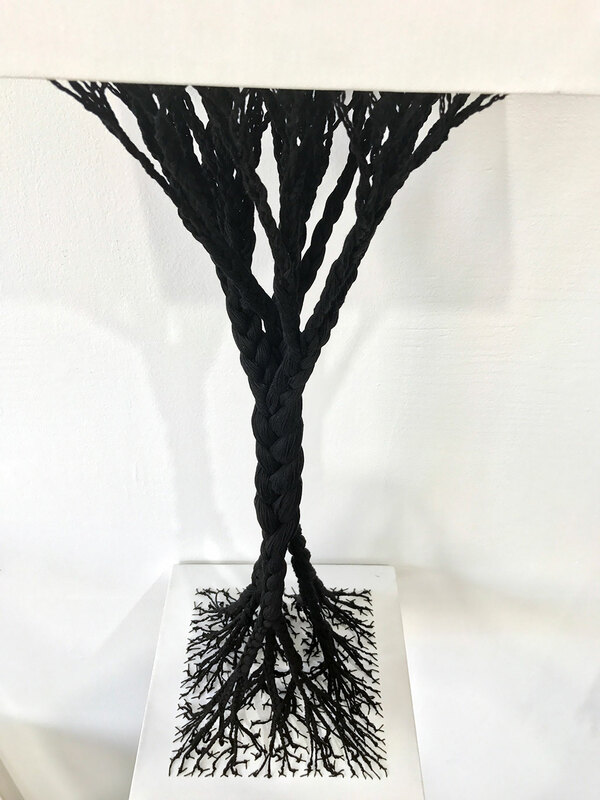 Using beads and threads, Scott physically stitches together ideas and figures together within each piece to form a cohesive whole. 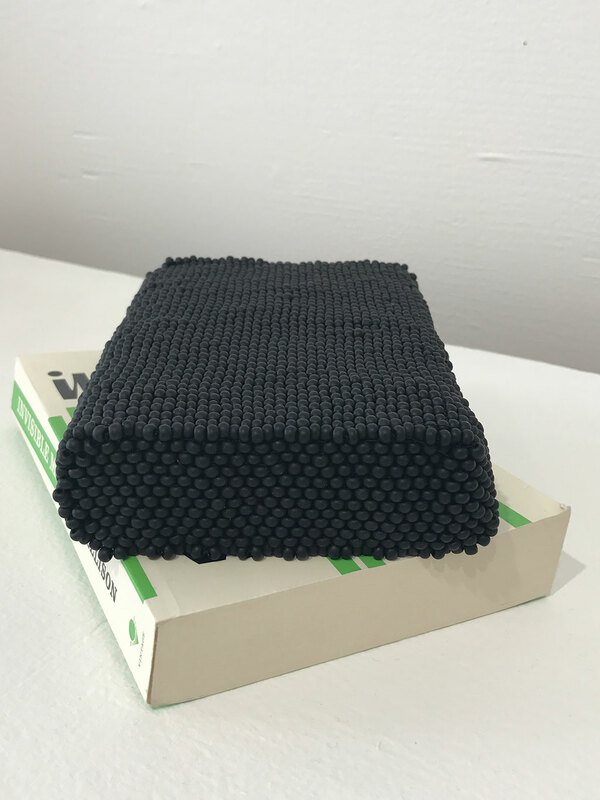 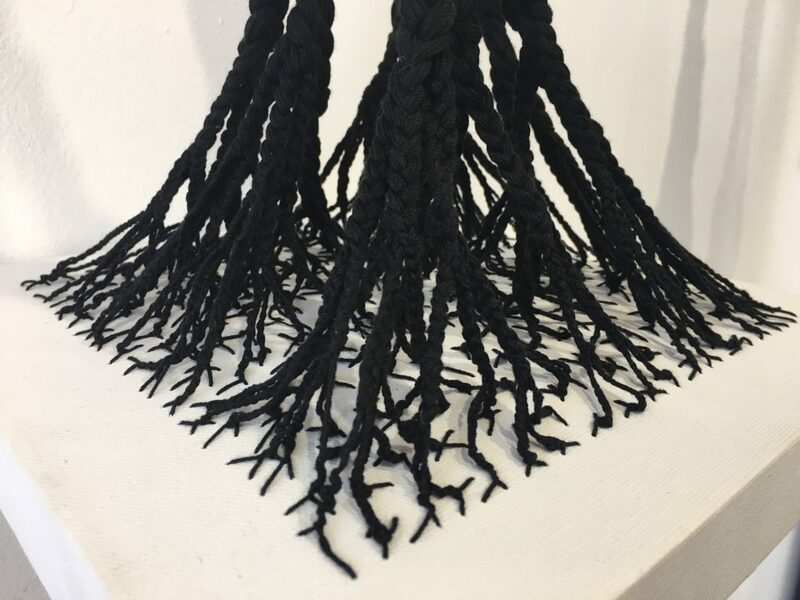 Essentially, these connectors function as the veins that branch off and hold everything together within the system of one work. 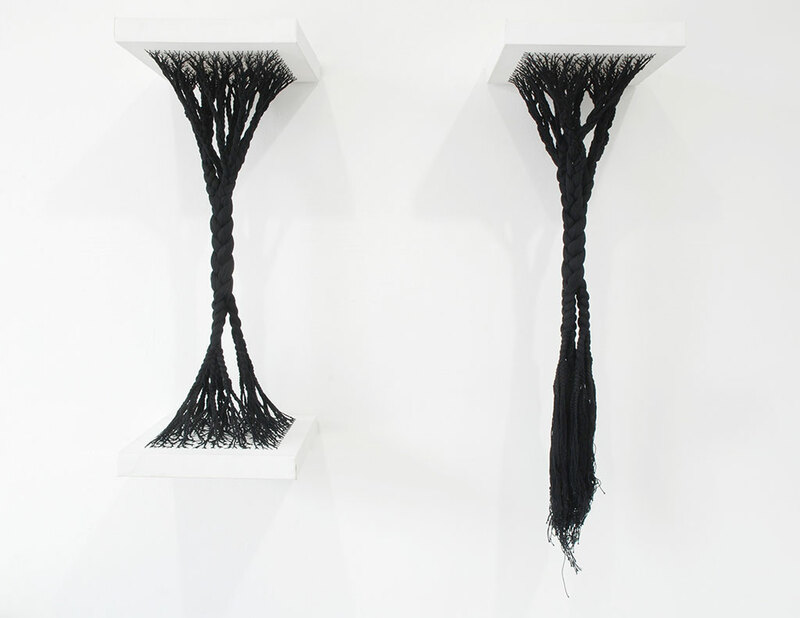 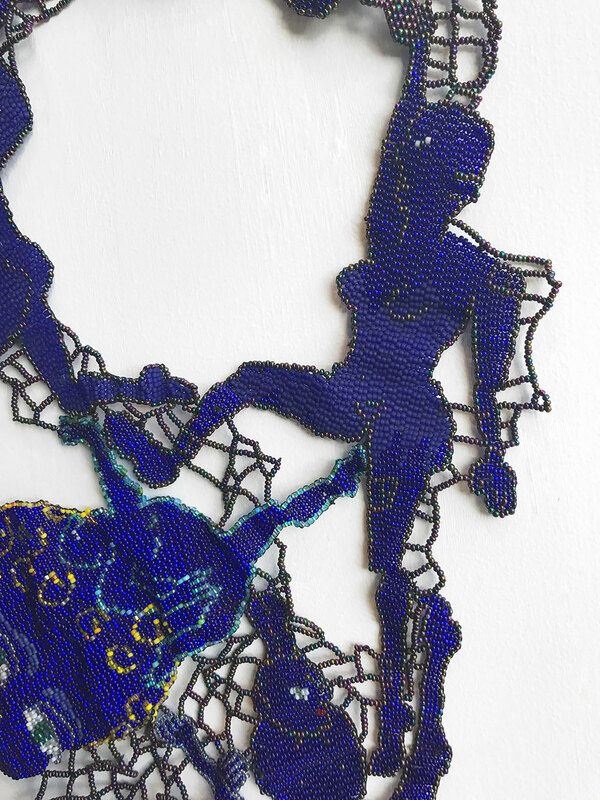 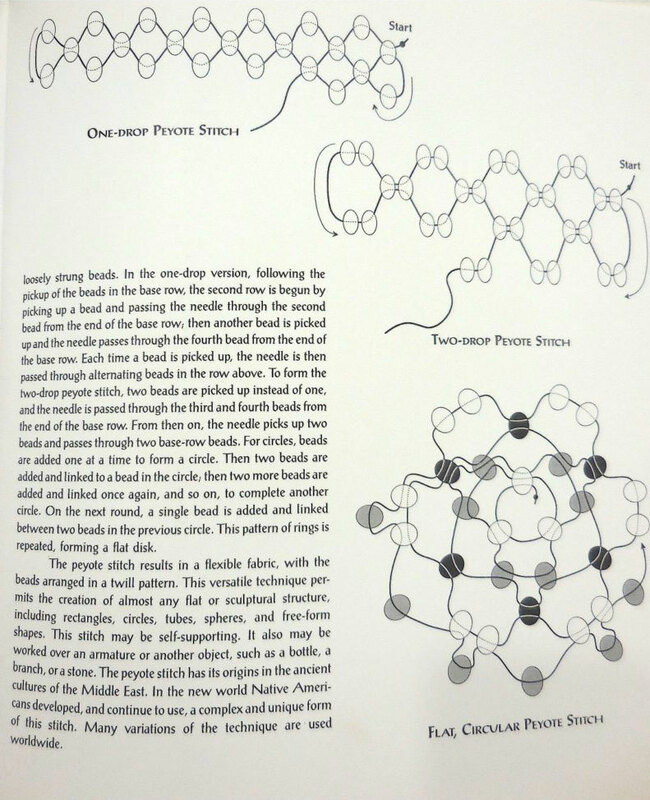 As she draws with her peyote-stitch, the webs between imagery act as dynamic stokes. 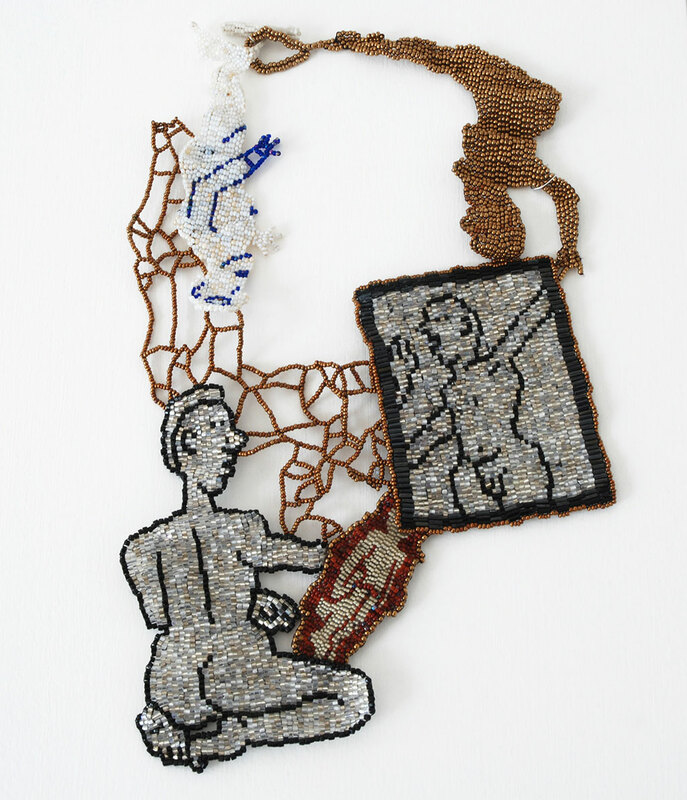 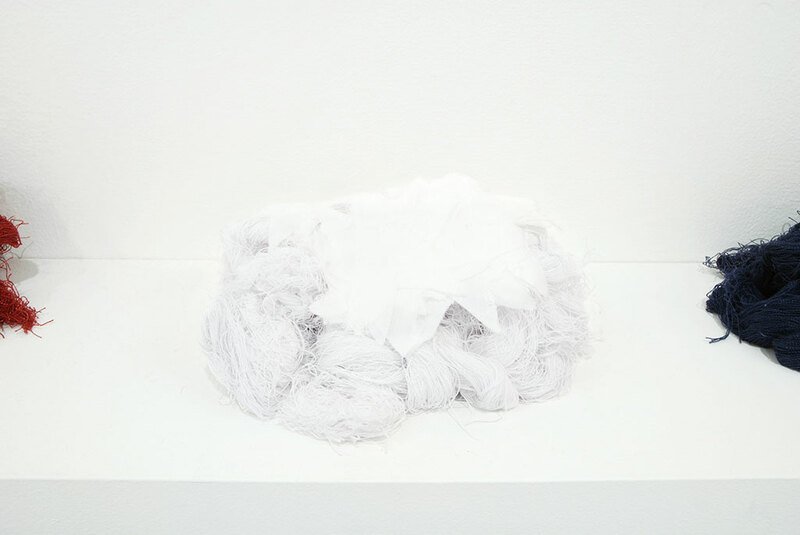 In a similar approach to interwoven and intersected imagery, DeVane, Sullivan, and Rhodes use their respective media to represent personal histories, idols and other concepts in their own work. 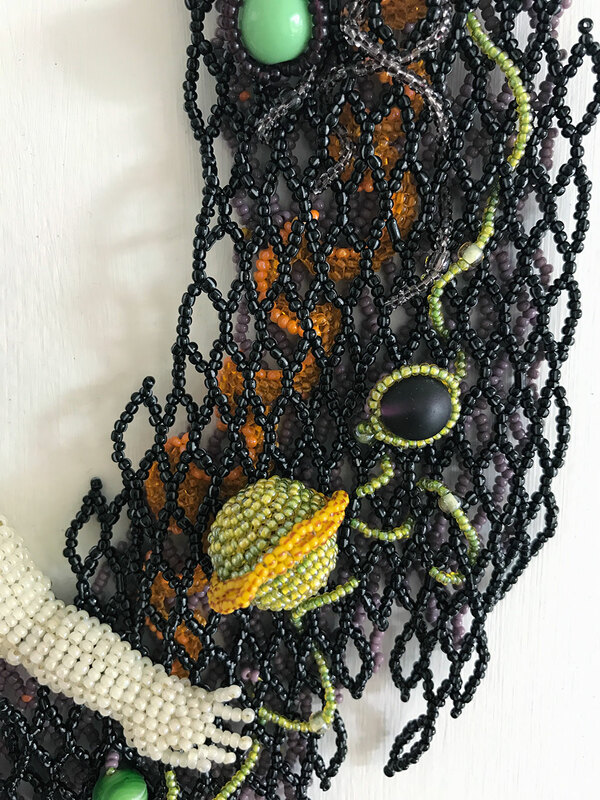 This exhibition was on display at the Craft in America Center, February 24 – April 14, 2018. 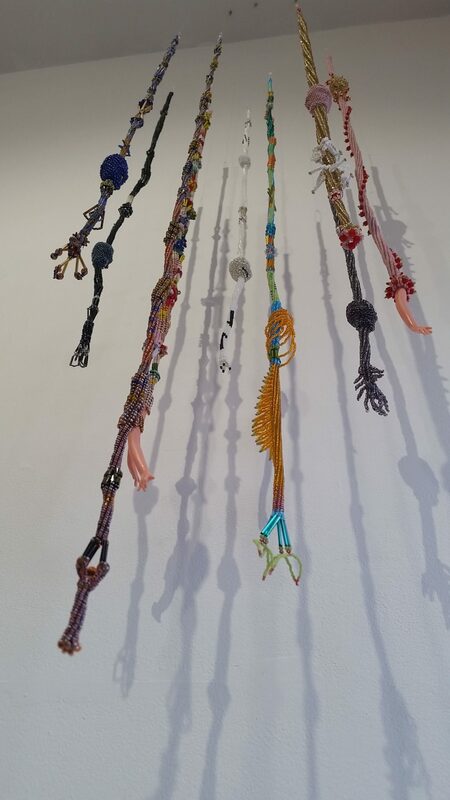 This past Saturday, we had the pleasure of hosting the opening for The Circuitry of Joyce J. Scott: A Group Exhibition of Collaboration and Innovation at the Center. 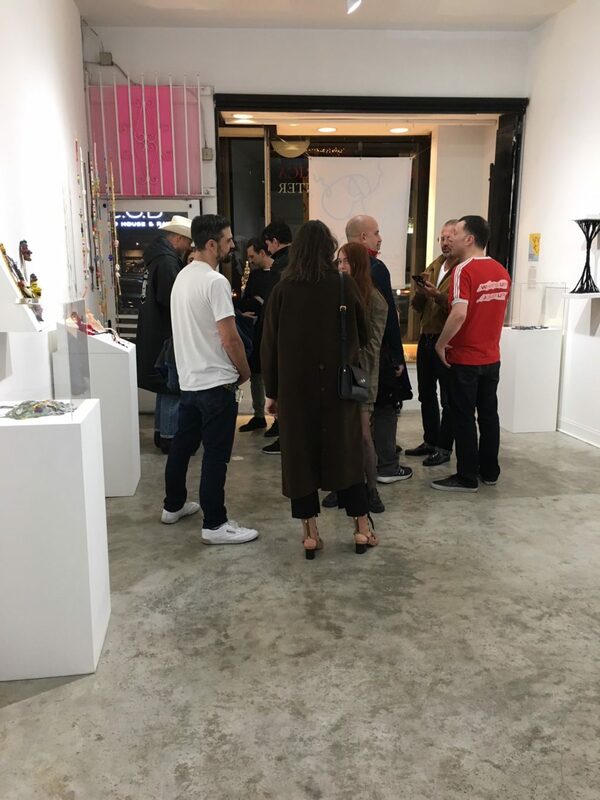 Artist William Rhodes was in attendance and able to explain his works in depth to people that asked. 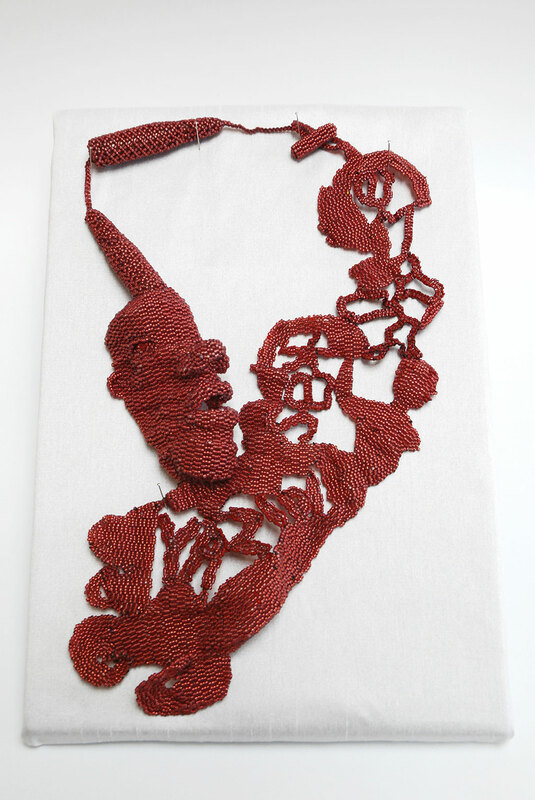 He spoke about his piece House of Ibeji in depth and told us how his father was born with a twin that didn’t survive. 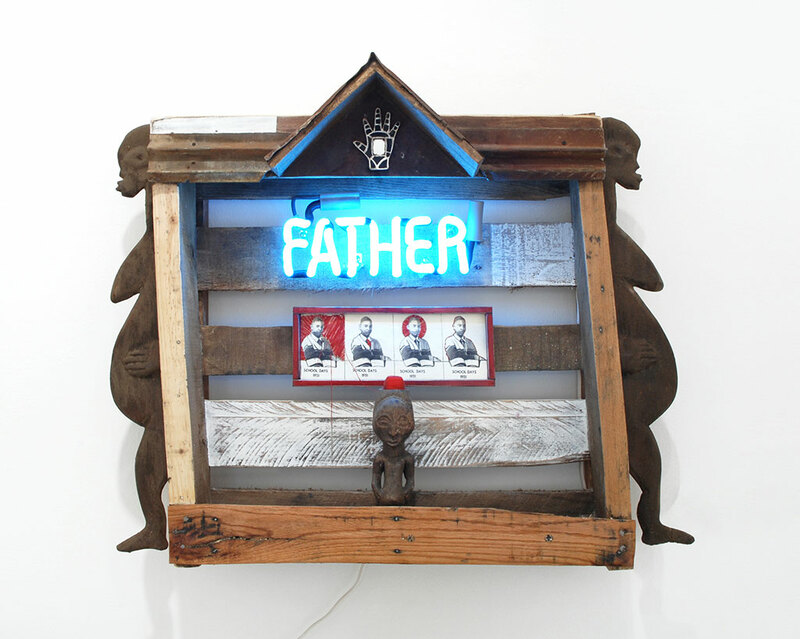 In the work, he imagines a past where he did. 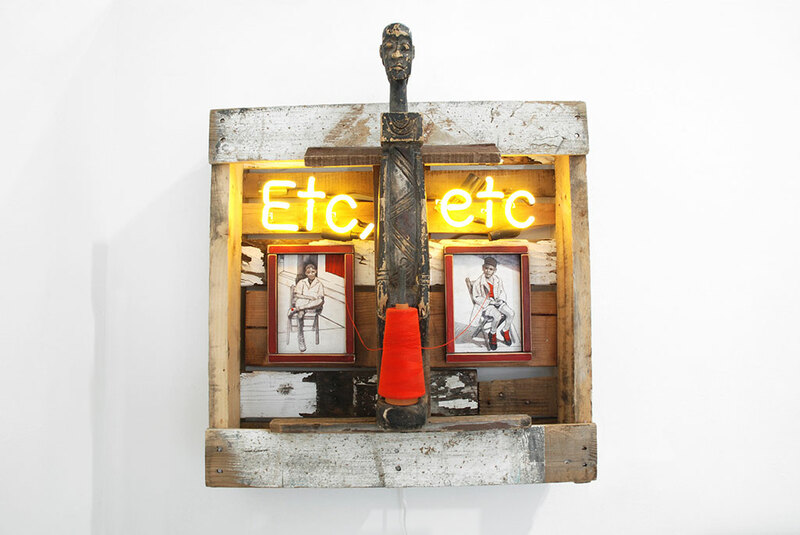 Rhodes was such a fantastic addition for the evening as he explained how he knew each of the artists. 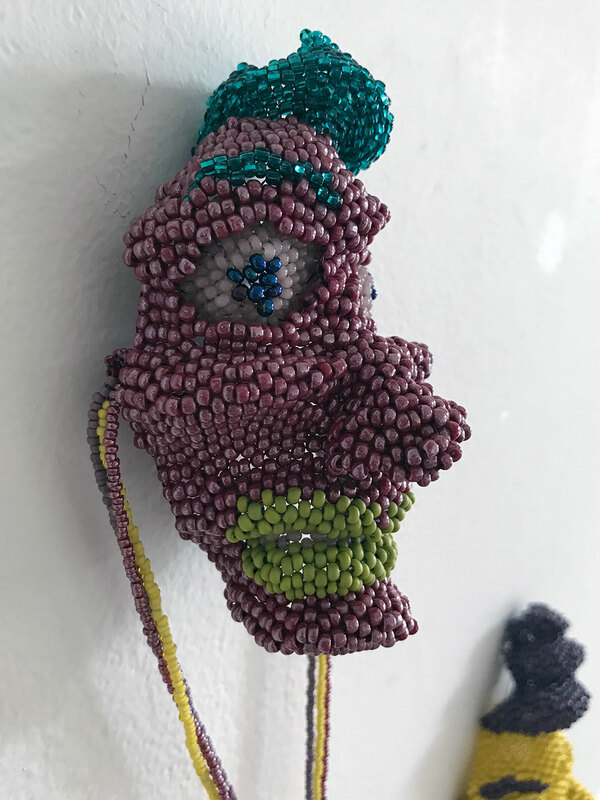 He grew up with Shana Kroiz. 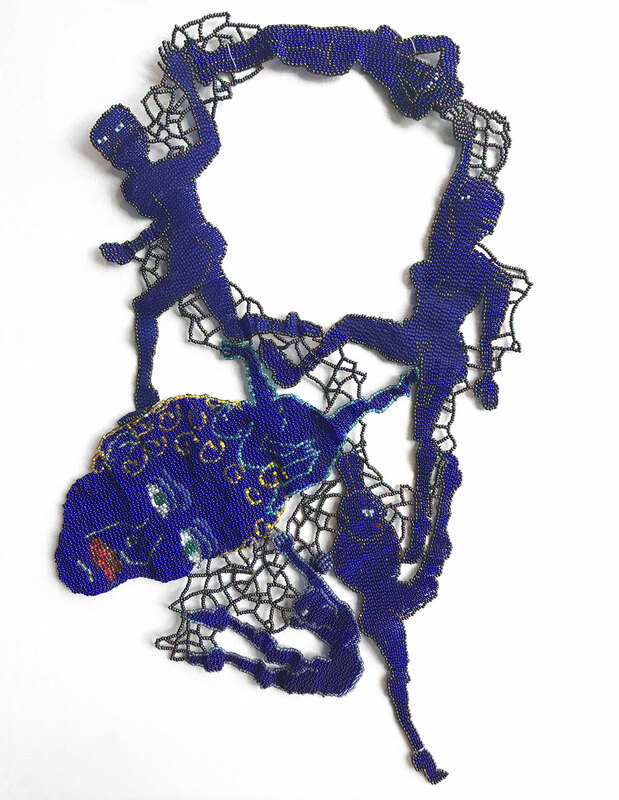 Both he and Kroiz knew Joyce J. Scott at a young age, and it was because of her tutelage, that they decided to become artists. 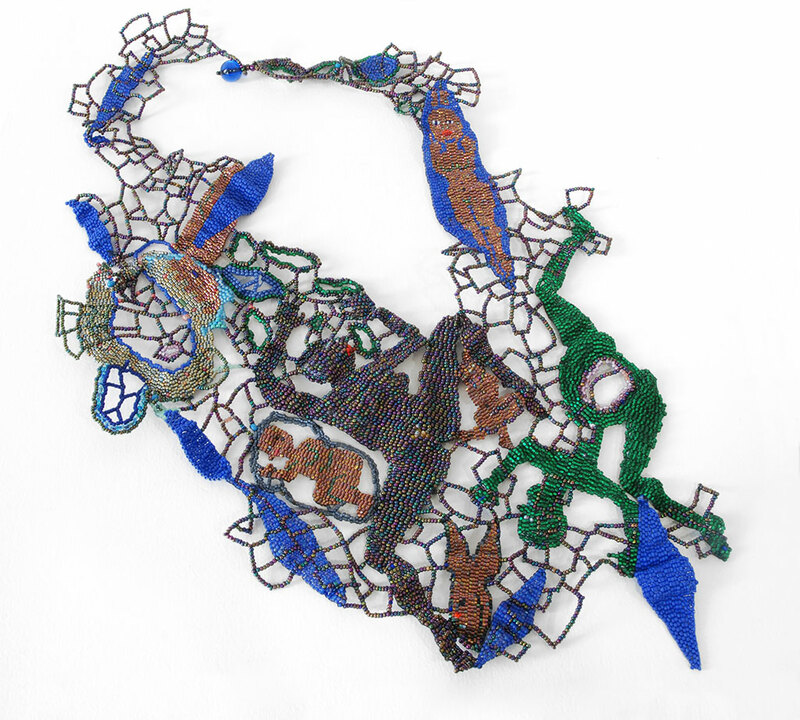 The Circuitry of Joyce J. Scott is open through April 14 at the Craft in America Center. 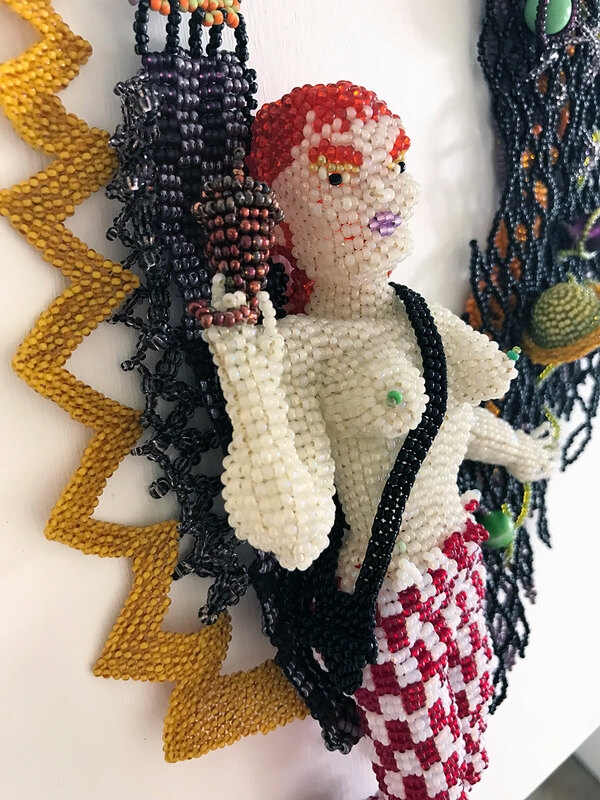 Opening reception an exhibition that forms a dialogue between over ten of Joyce J. Scott’s exemplary beaded neck pieces placed in conversation with beaded, fiber, and mixed media works by Sonya Clark, Oletha DeVane, Eve France, William Rhodes, and Teresa Sullivan. 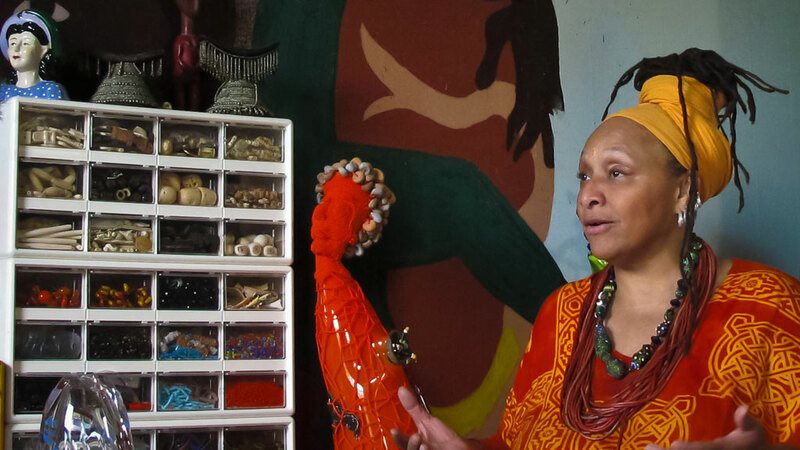 Visionary artist Joyce J. Scott works in a multitude of media and has had a profound influence on various communities of artists through her beaded sculpture, art jewelry, and more. 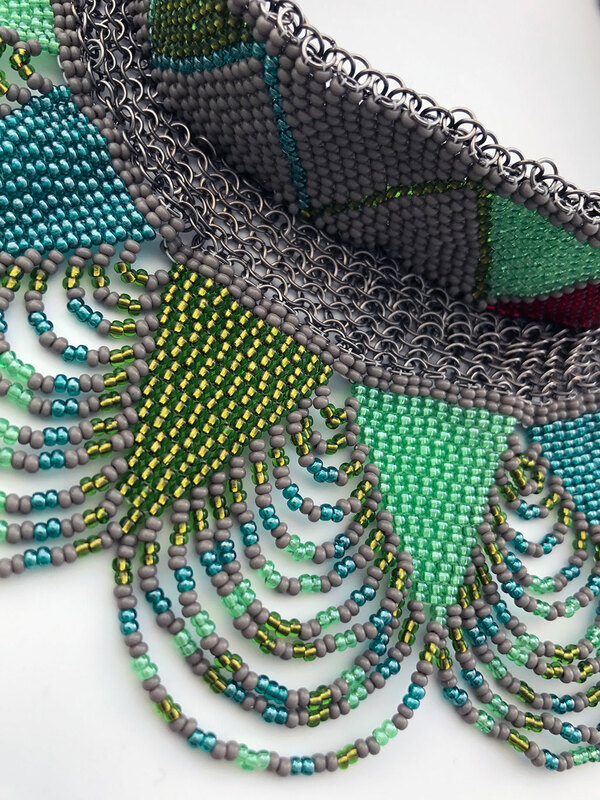 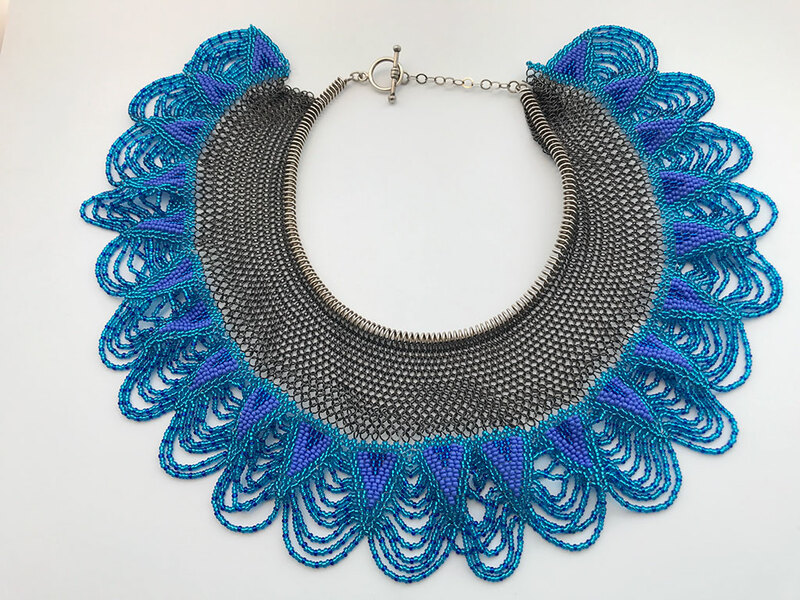 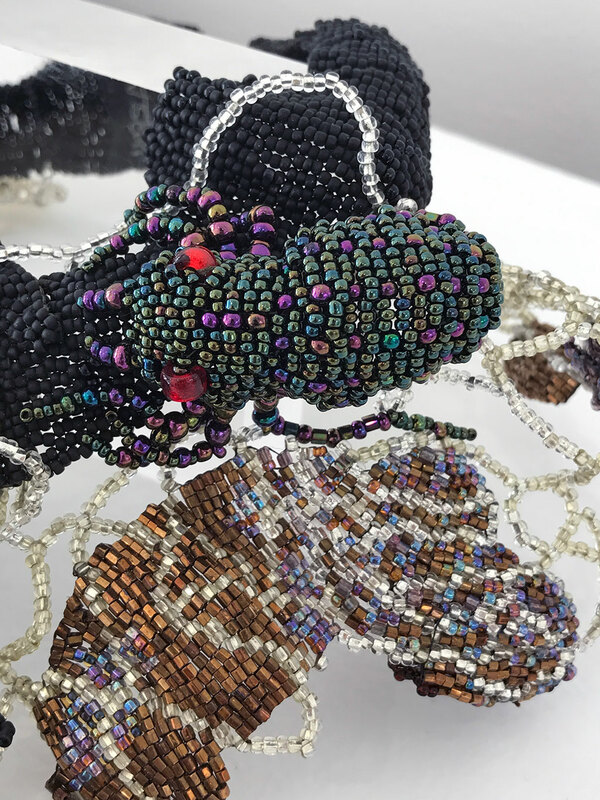 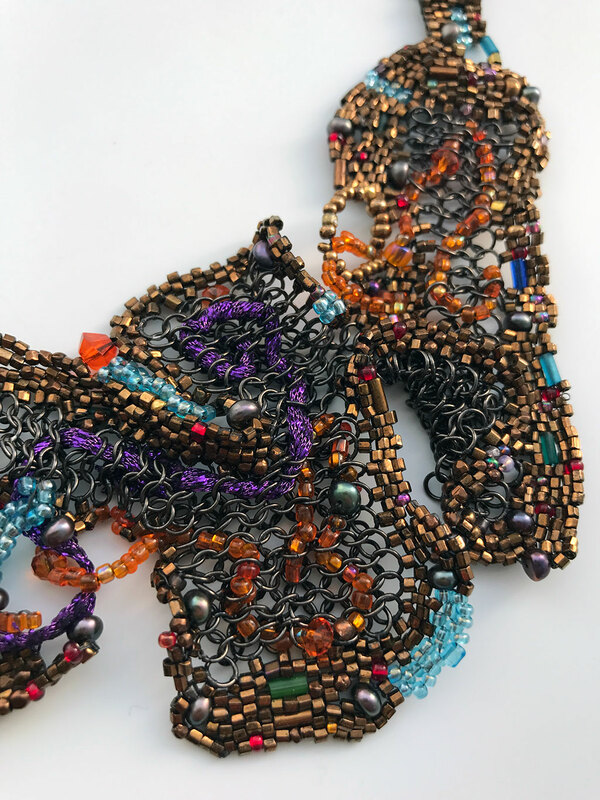 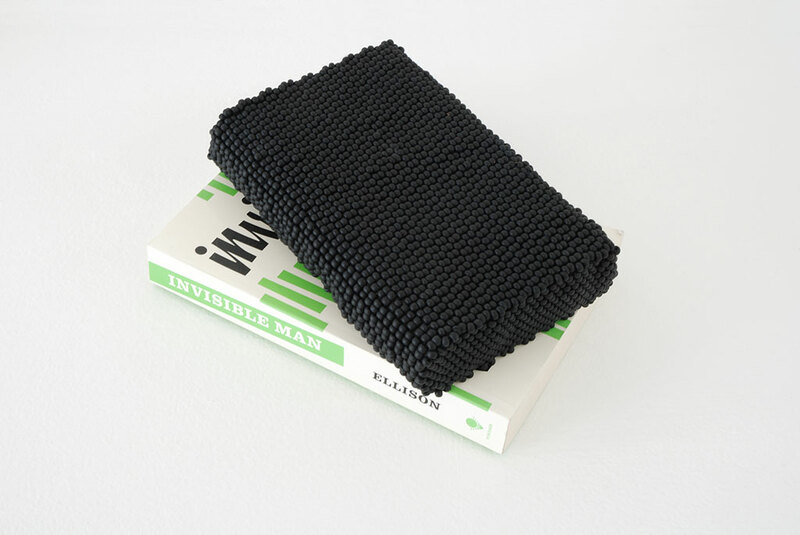 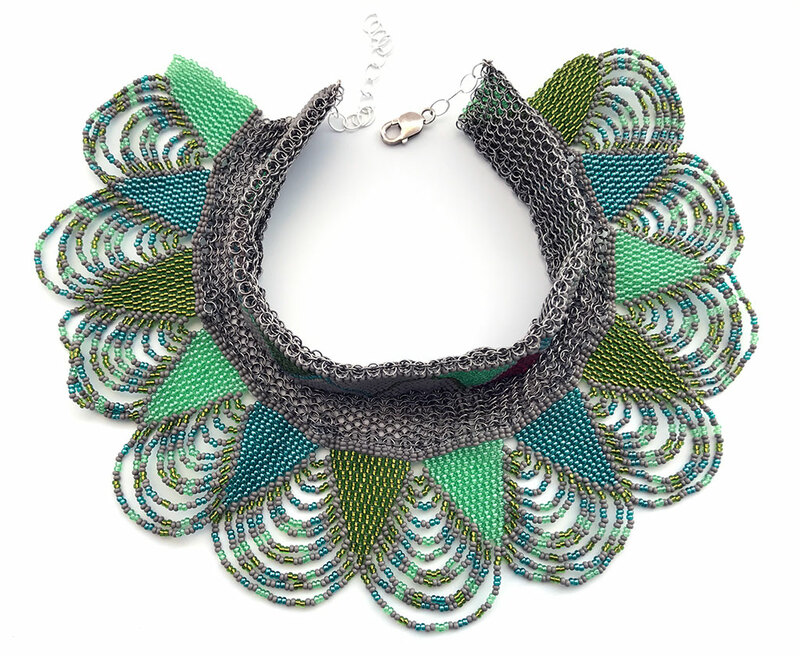 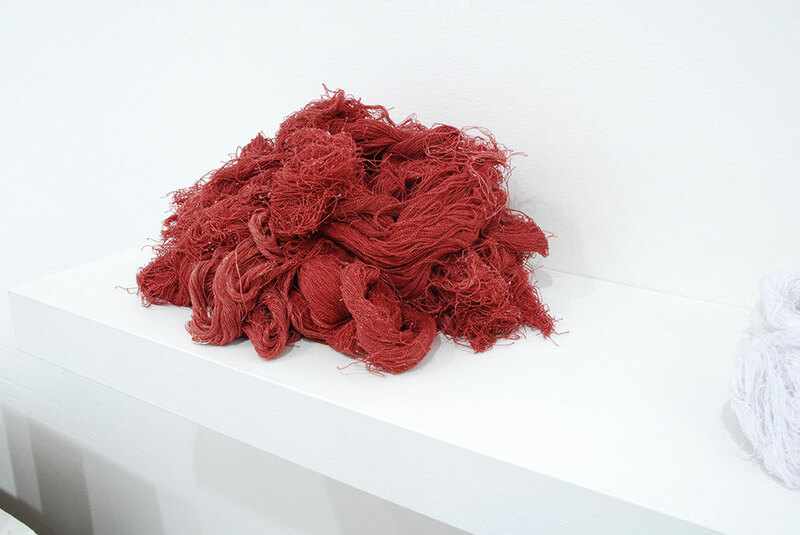 Scott shapes her work through connections formed bead-by-bead, piece-by-piece, and thread-by thread. 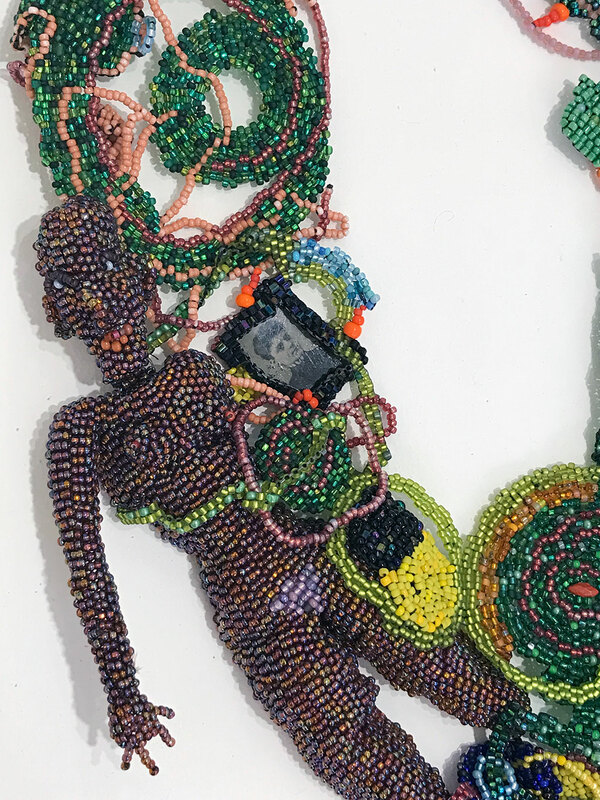 Circuitry, for Scott and this exhibition, is approached in four ways: through the construction of her pieces; as connection to the past; as hard-wiring to the national and global present; and finally, via Scott’s network of artists and friends. 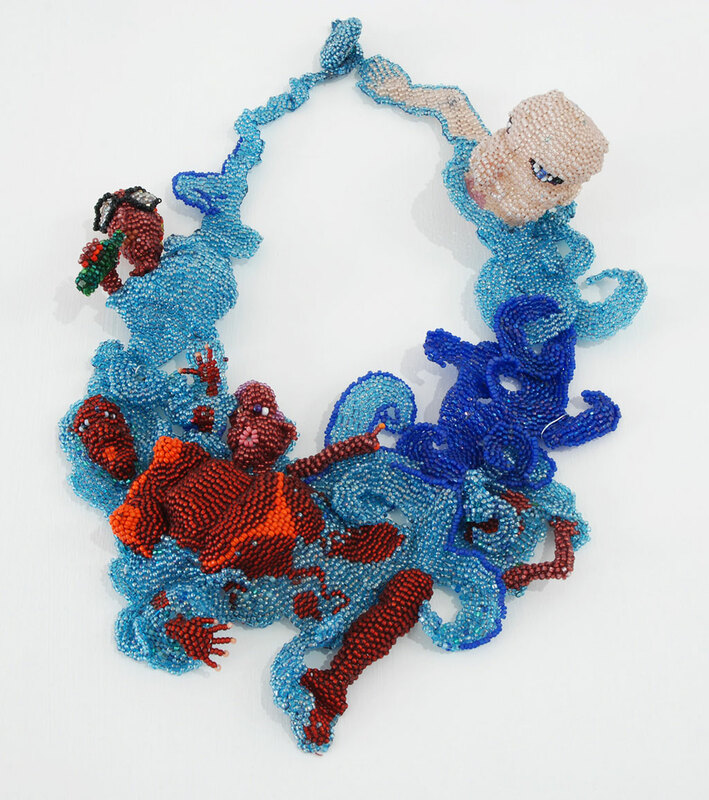 Scott and the other artists included in this exhibition push and expand the potentiality of what sculpture and wearable art can be, where they intersect, and how they affect each other. 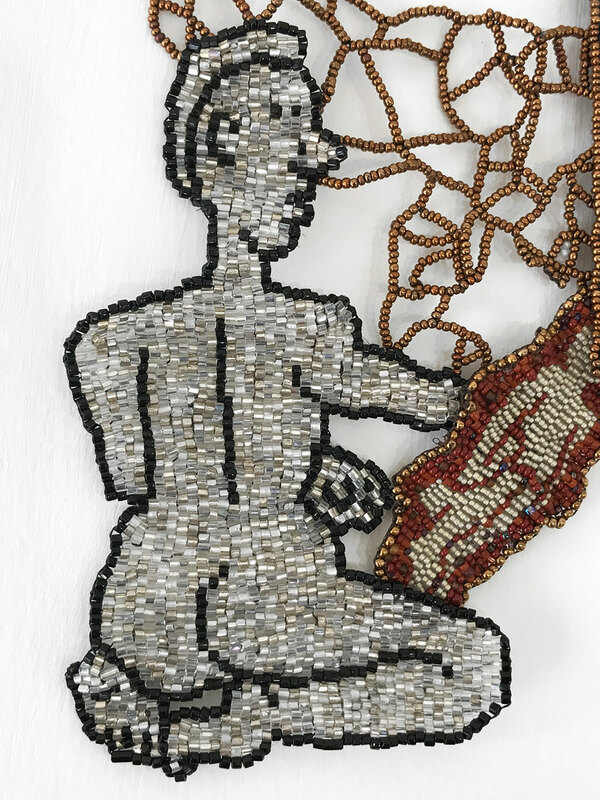 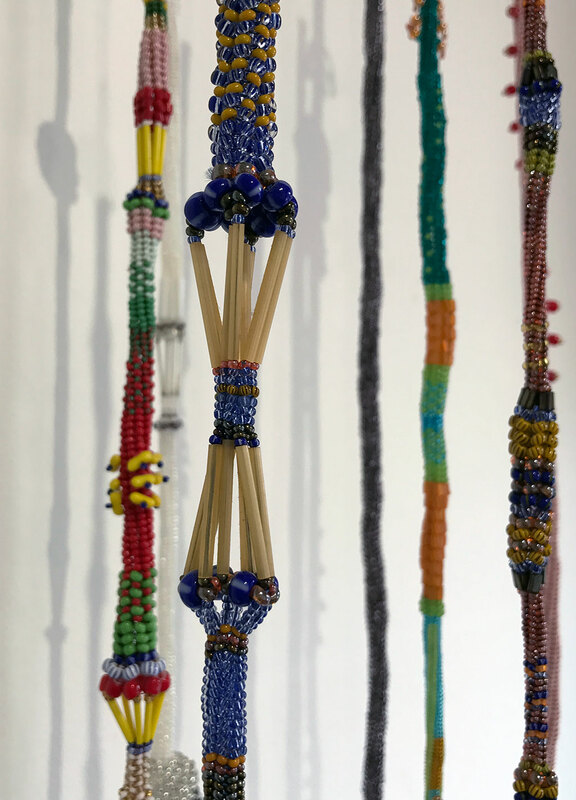 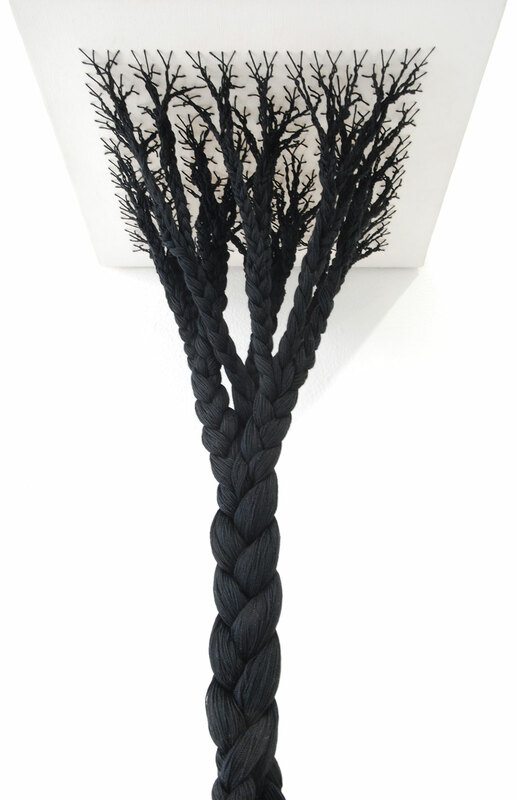 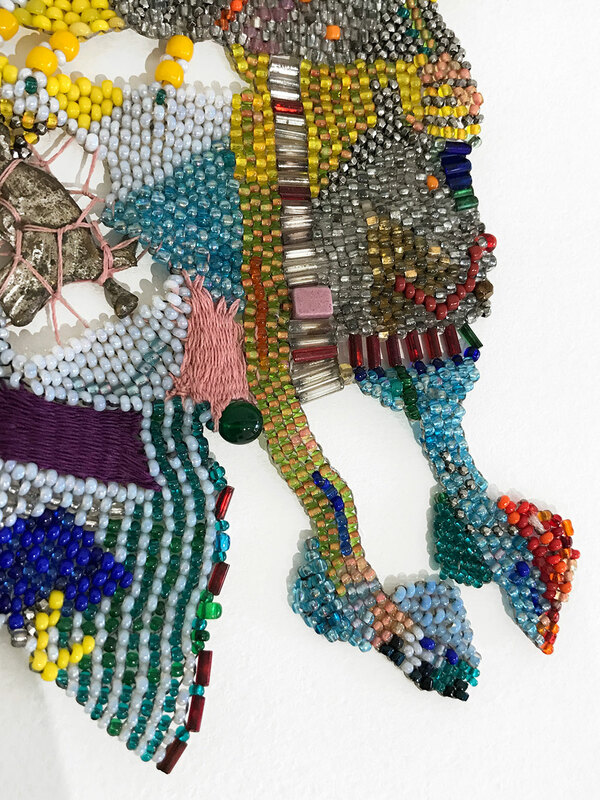 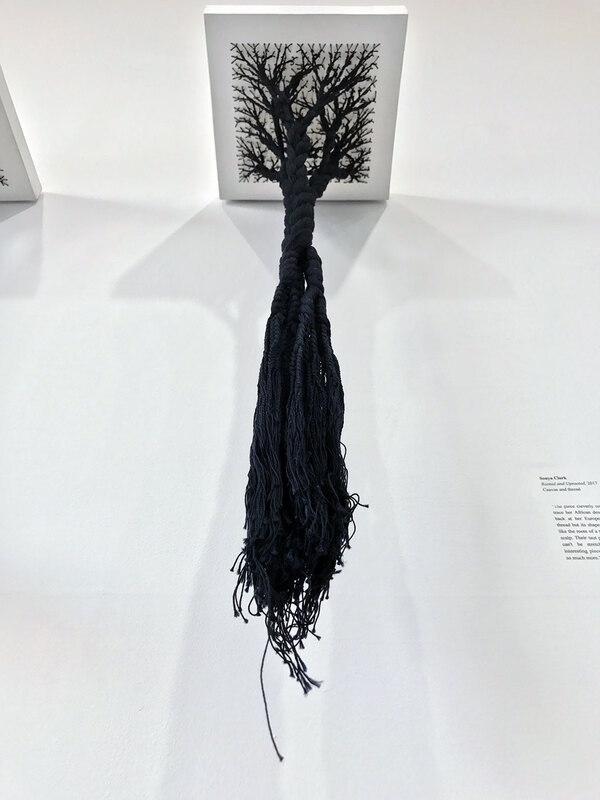 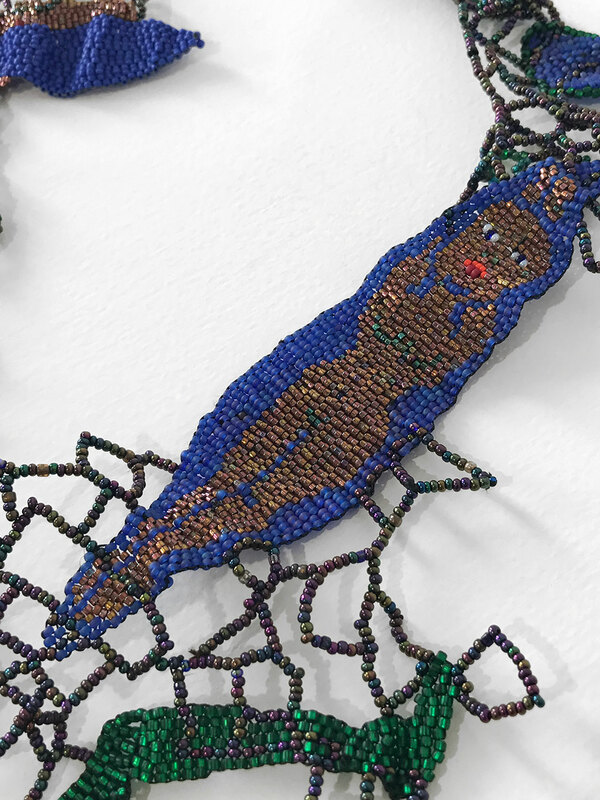 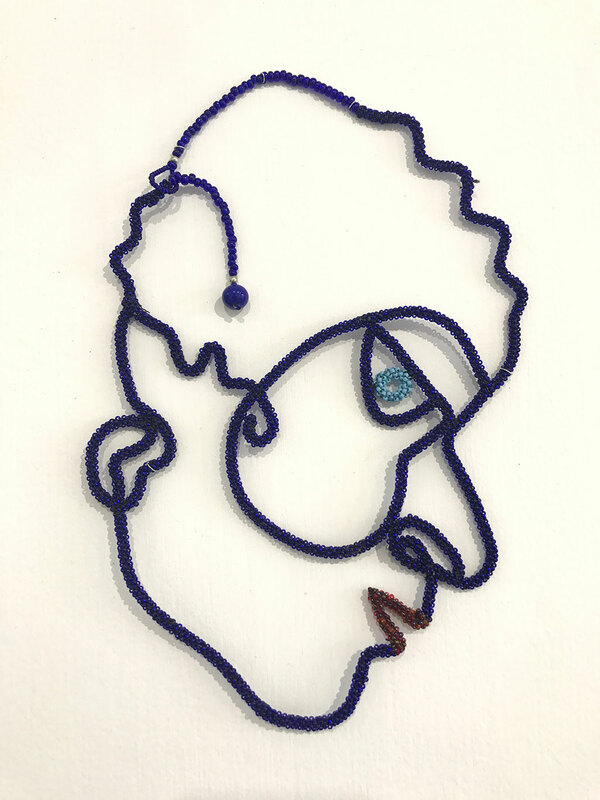 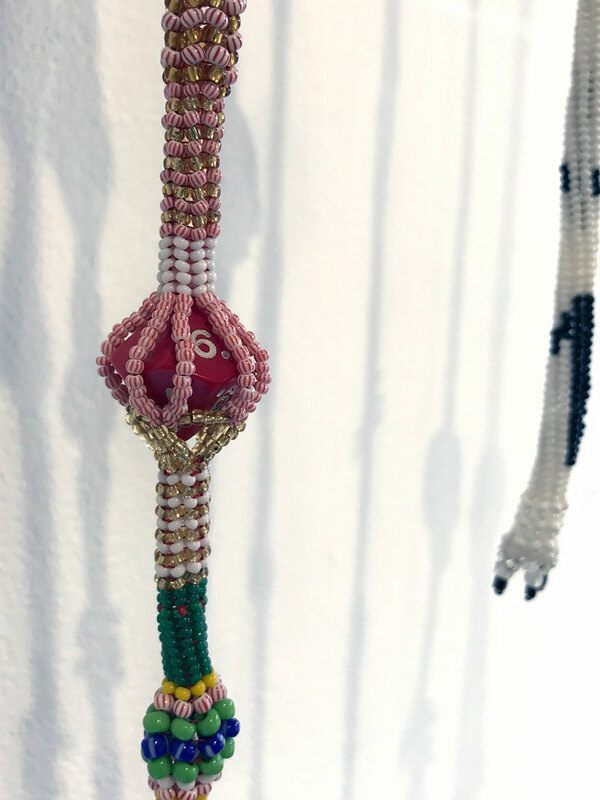 This exhibition forms a dialogue between ten of Scott’s exemplary beaded neck pieces placed in conversation with beaded, fiber and mixed media works by Sonya Clark, Oletha DeVane, Eve France, William Rhodes, and Teresa Sullivan. 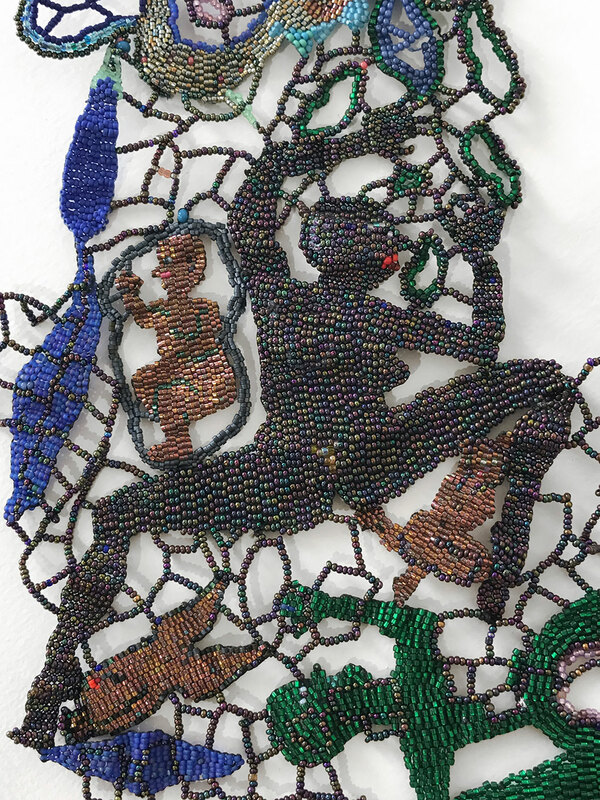 Scott, recipient of a MacArthur Fellowship in 2016, is a printmaker, weaver, sculptor, performance artist, and educator who lives and works in Baltimore, Maryland. 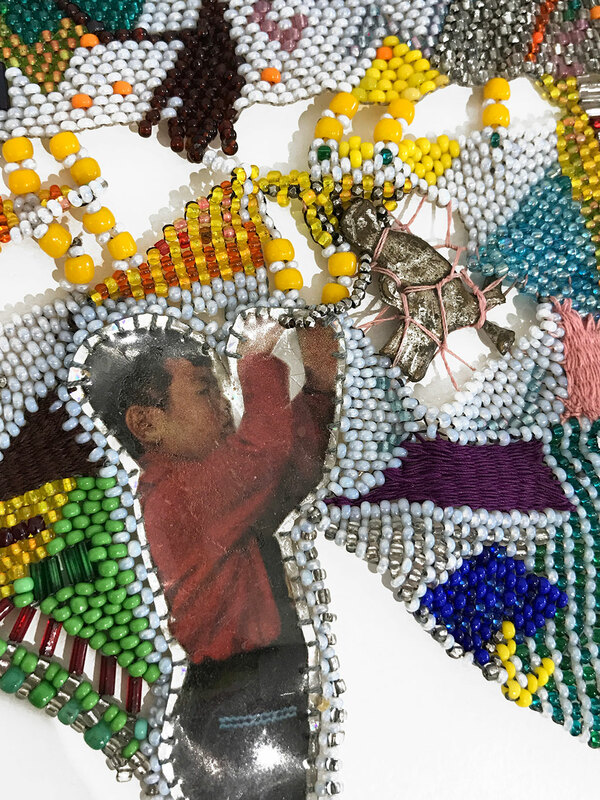 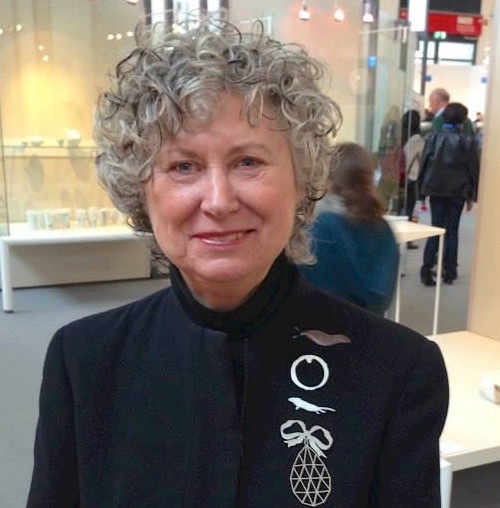 Scott received her BFA from the Maryland Institute College of Art and MFA from the Instituto Allende in San Miguel de Allende, Guanajuato, Mexico. 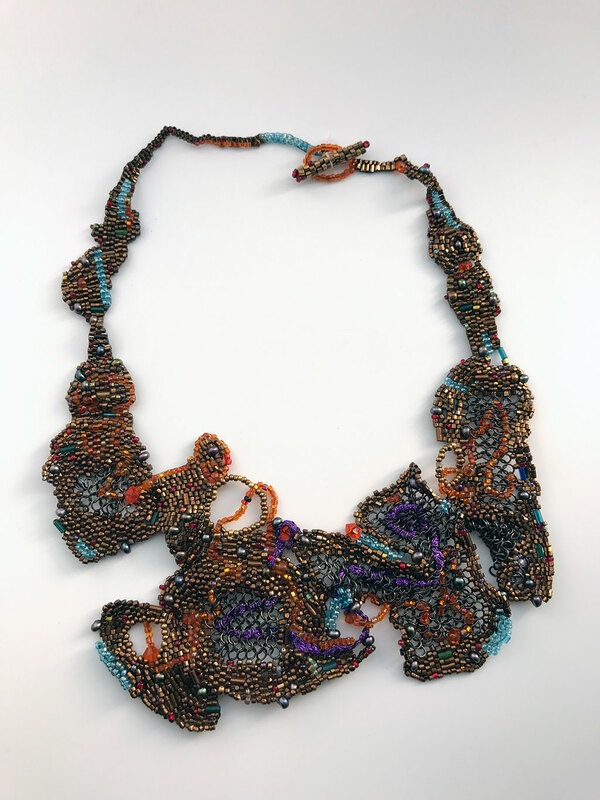 Her esteemed work is in private and public collections including: the Baltimore Museum of Art, Mint Museum of Craft + Design, Philadelphia Museum of Art, and the Smithsonian American Art Museum. 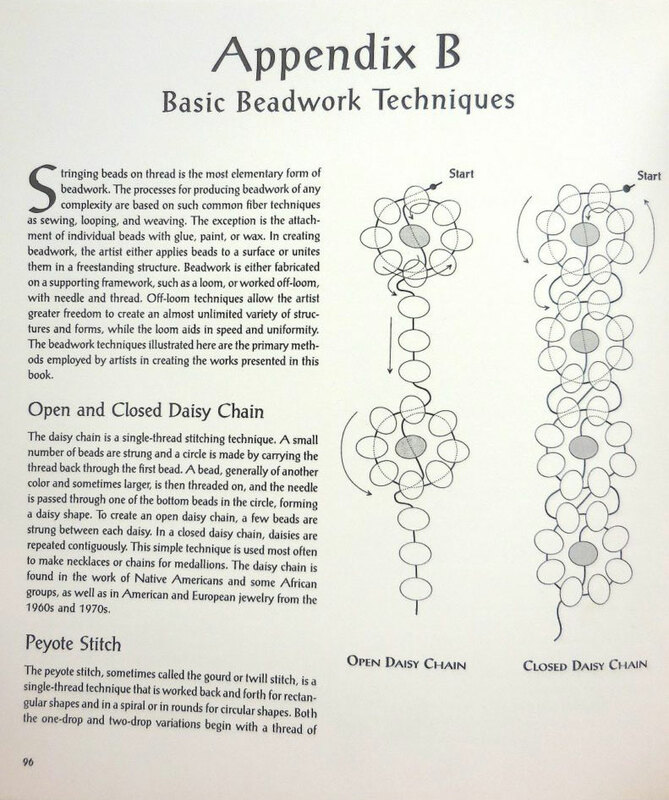 Scott was featured in the MESSAGES episode of Craft in America.